All my life there has been a connection to a mountain, and it is the largest and most formidable piece of rock on the planet. 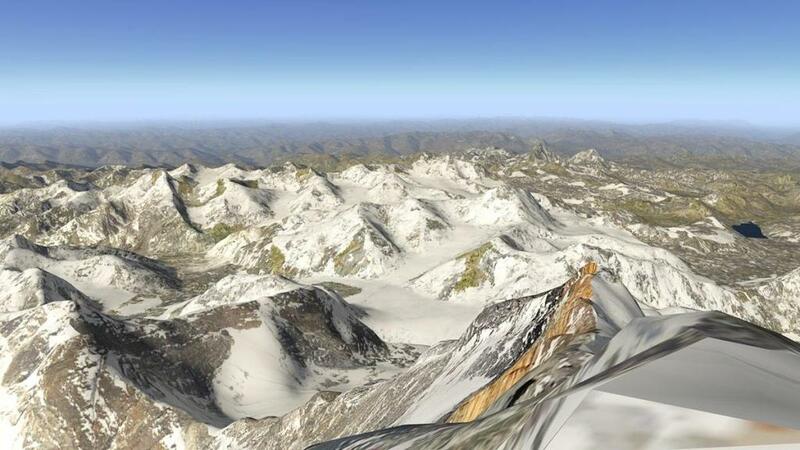 The mountain is Mount Everest or Sagarmatha (सगरमाथा) and in Tibetan it is noted as Chomolungma (ཇོ་མོ་གླང་མ). 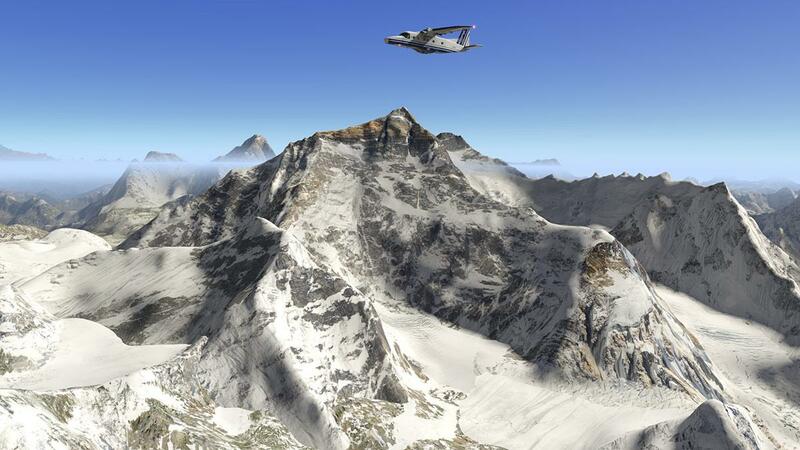 The monolith straggles both the borders of Tibet and China and dominates the Mahalangur Himal sub-range of the Himalayas. 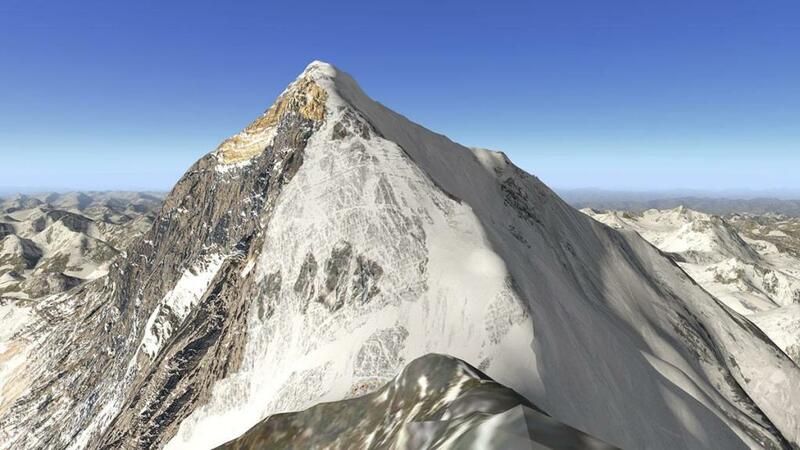 The mountain's full height is 8,848 metres (29,029 ft), but that estimate changes from year to year, but extremely seriously high is close enough. As I was born in the United Kingdom in the 50's then the conquest of the mountain in 1953, with a ninth British expedition led by John Hunt was a national empire success story. 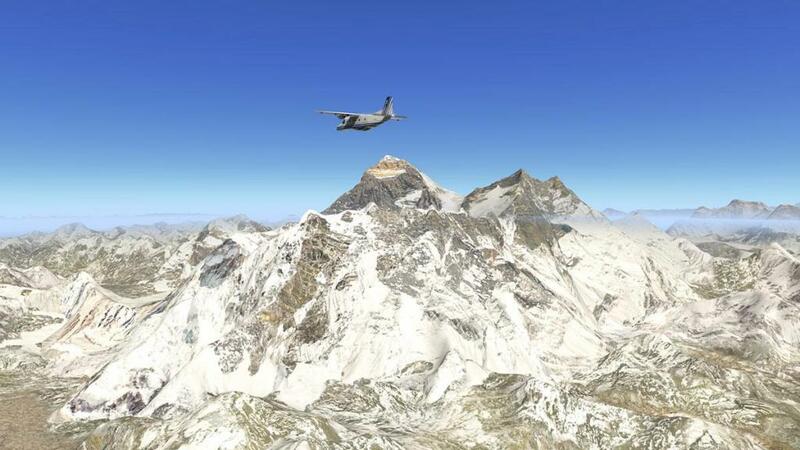 Hunt selected two climbing pairs as then as the first pair failed just 100m from the summit, it was the second pairing of the New Zealander Edmund Hillary and Tenzing Norgay, a Nepali Sherpa climber that the feat was finally successful when they reached the summit at 11:30 local time on 29 May 1953 via the South Col route. 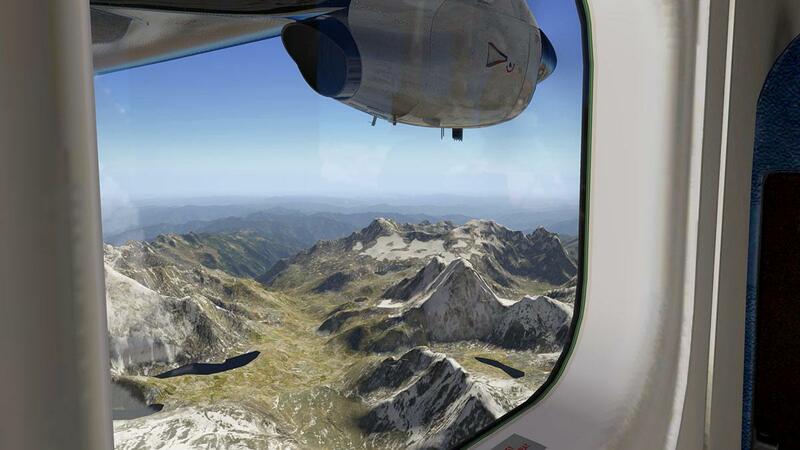 As in all areas of life then also as in X-Plane it tends to break up teams into specific categories. 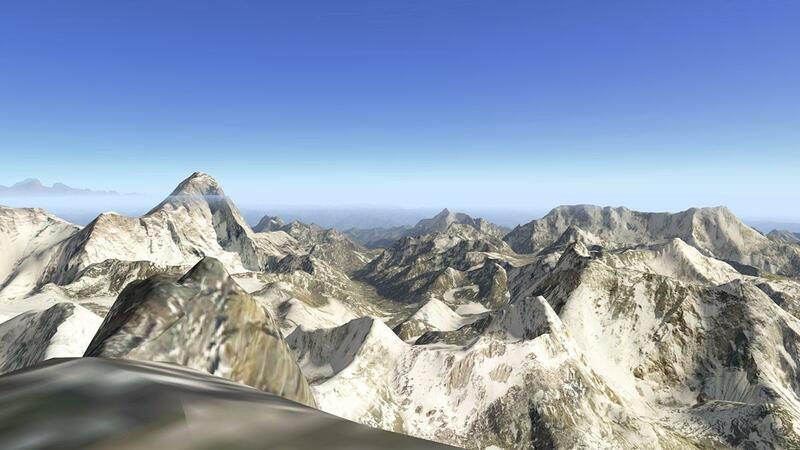 For the names of Frank Dainese & Fabio Bellini it is in the specialist area of mountainous regions. 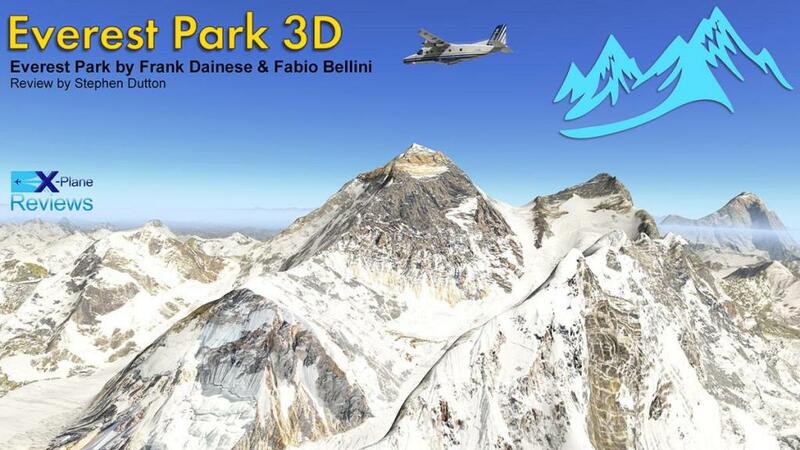 It started with the their excellent "Dolomiti 3D" Scenery, then there was the excellent Matter﻿horn Park 3﻿D as reviewed earlier this year... now it is the turn of the largest mountain range on earth with the Everest Park 3D scenery. The Everest Park 3D scenery is noted to cover territory of about 1000 square kilometers in the Himalayas along with another eight thousand in a lower resolution and situated along the border between China and Nepal. 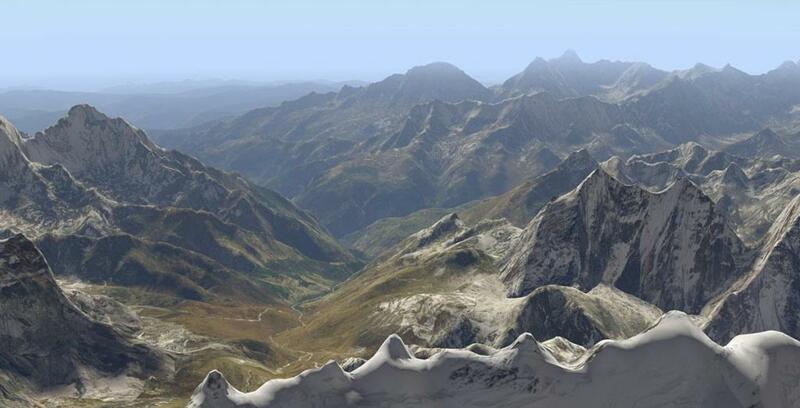 Other famous mountains included here besides Mt. 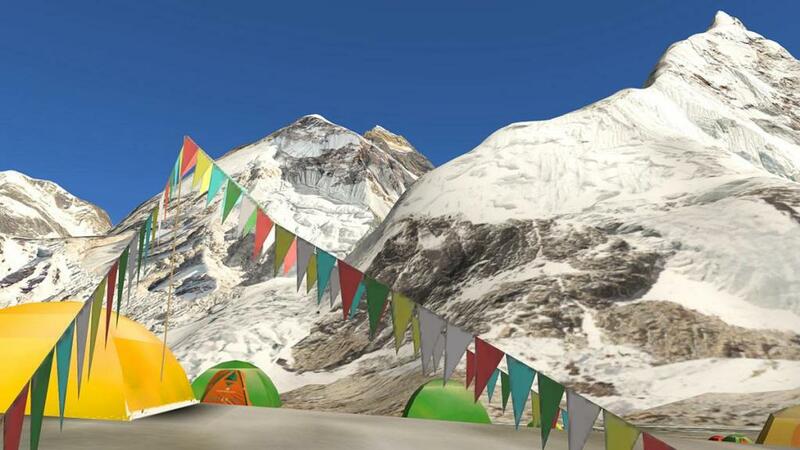 Everest (8,848m) are the Lhotse (8516), Makalu (8463), Nuptse (7861), Pumori (7161), Ama Dablam (6812), Taboche (6543), Baruntse (7129) ...The scenery area included here is in the degrees +27.086 +27.087 + 28.086 +28.087. 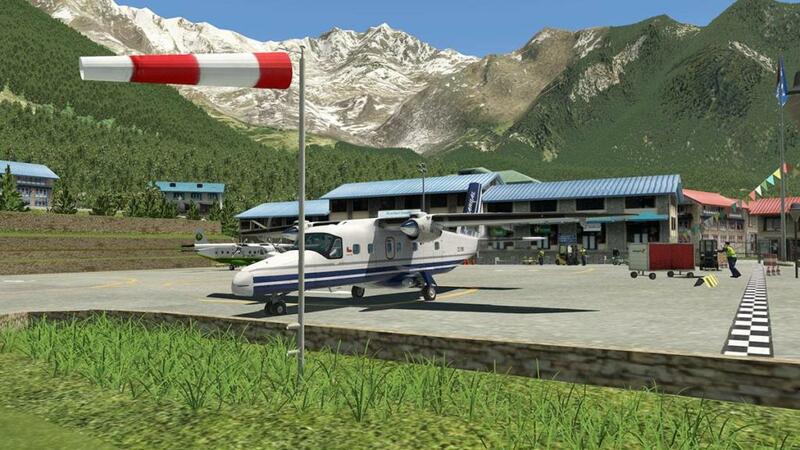 Airports and Helipads included are VNLK - Lukla airport, VNSB - Syangboche... Helipads Base of HELK - Lukla, Base of HENB - Namche Baza and coverage of Lukla and Namche Bazar, Everest base camp, Tengboche which is home to an all important Buddhist monastery and Gorak Shep. 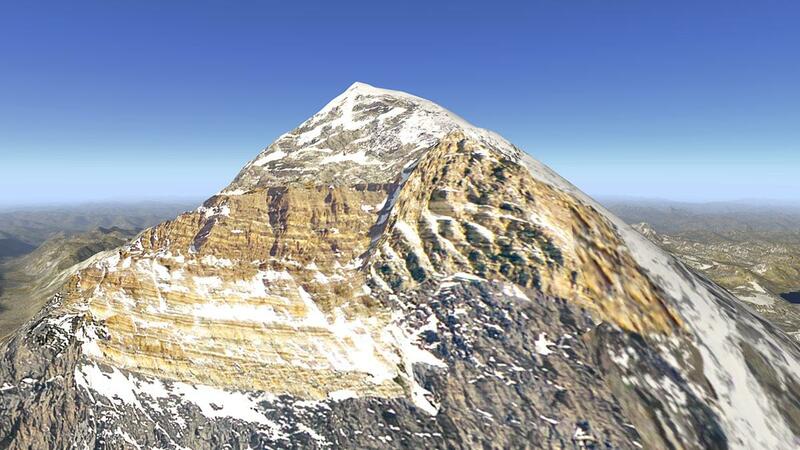 Noted as well is the Pyramid of the CNR (Italy) at 5050 mt. 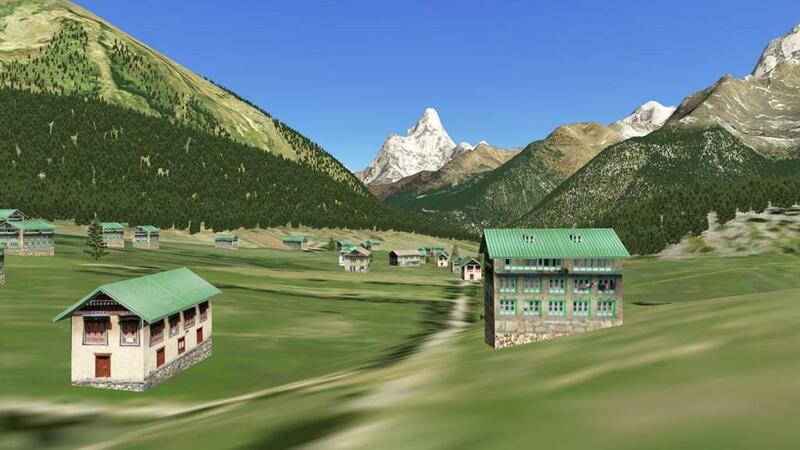 Laboratory and Observatory in the Khumbu Valley, it is a center of study and medicine on the reactions of the human body at high altitudes. 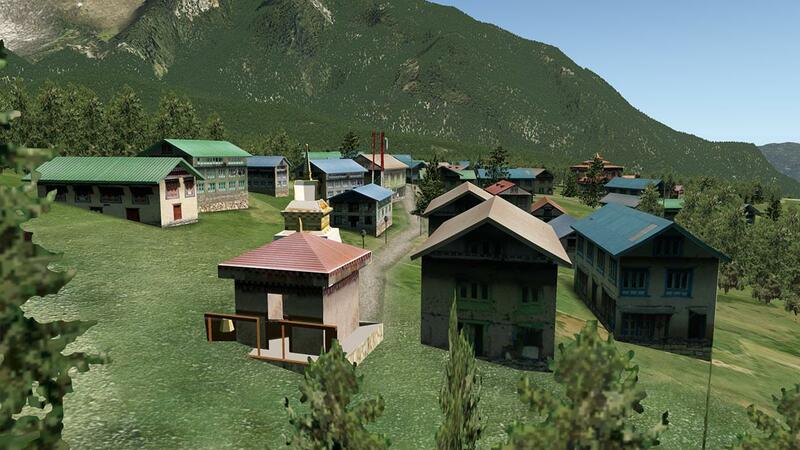 Folklore of my childhood was the trek from Katmandu to the fabled mountain. 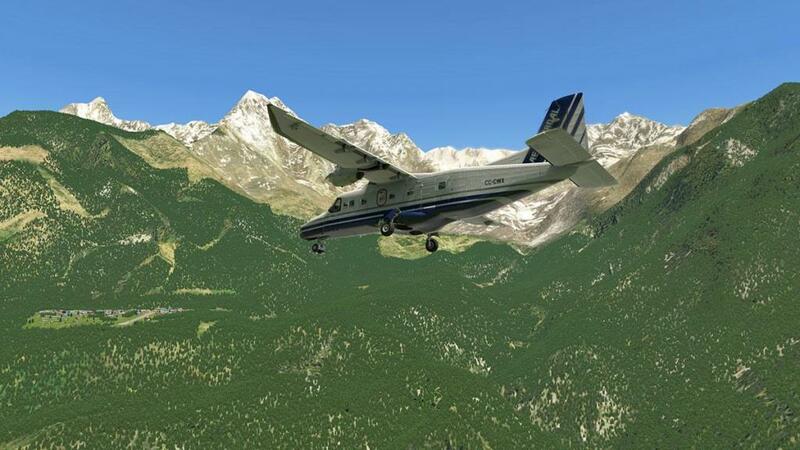 You walked for three weeks carrying mountain gear along Sunkashi River, then up through the Khumbu Valley via the Dudh Kosi (Kosi River System) with names like Namche Baza and Tengboche then Dingboche and finally the Village of Gorak Shep at 16,942 ft (5,164 m) which was the last stop before reaching the Everest Base Camp. 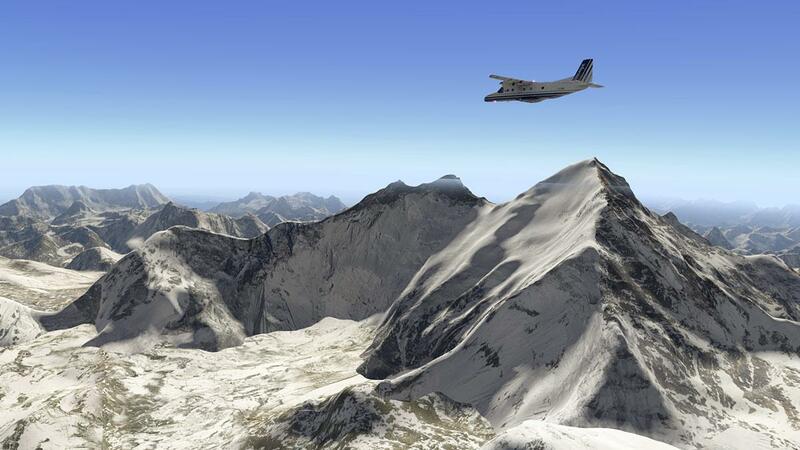 It was treacherous, dangerous and the survival of the fittest and required rest days to acclimatise to the altitude. It was exotic and a world away from today's consumer travel expeditions that make the same trek almost like going to the South of France. 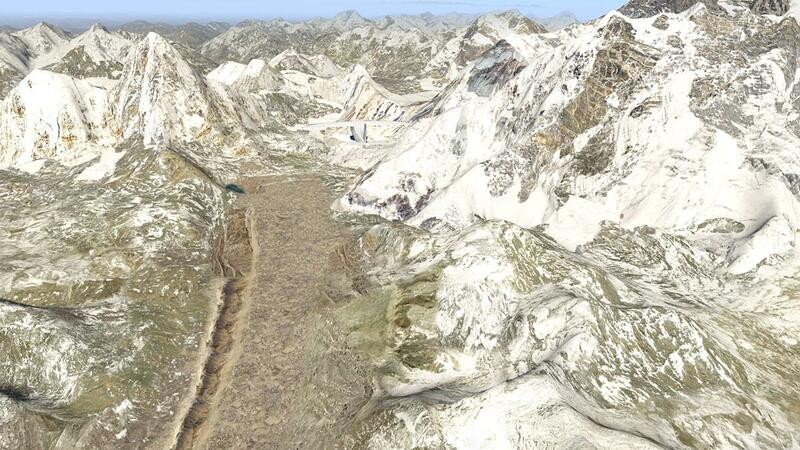 It still isn't easy to get to Everest Base Camp, but it is now just a rubbish tip like everywhere else we populate. 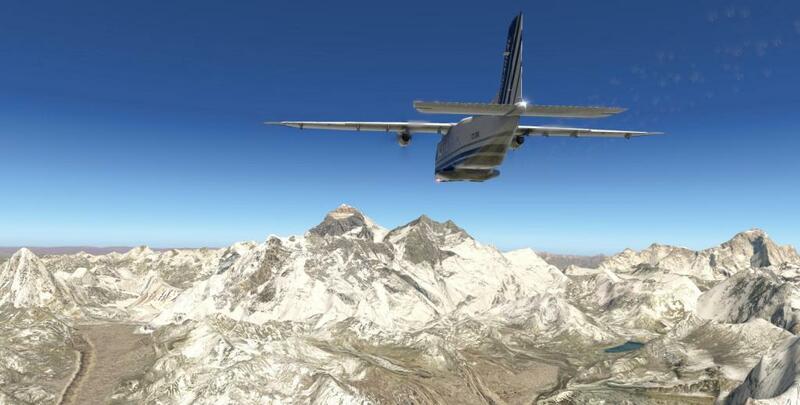 I have seen Mt.Everest in X-Plane before, I used to route regularly over the area when returning from Shanghai, China to Bahrain on my criss-cross of the globe with my F1 Racing freight in the rear. 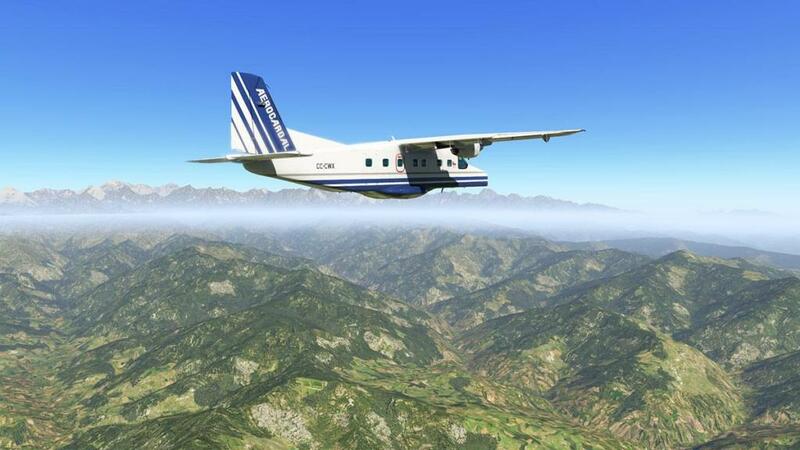 There are no air routes over the Himalayan area and for a very good reason. Mt. 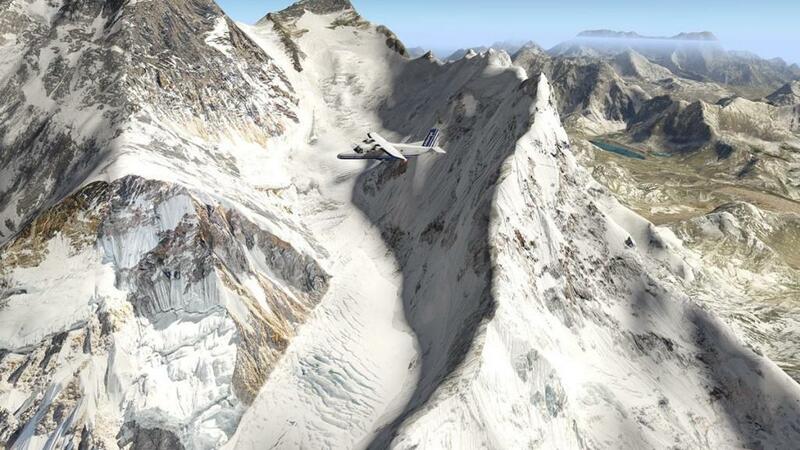 Everest is nearly 29.000ft high, so at 35.000 ft at altitude the mountain's sheer size can be still frighting to be passing only 6000ft below the aircraft's belly, do that in bad weather and it can go seriously wrong, but on a clear day the view was excellent, if to the limited capacity of X-Plane's early standard mesh. 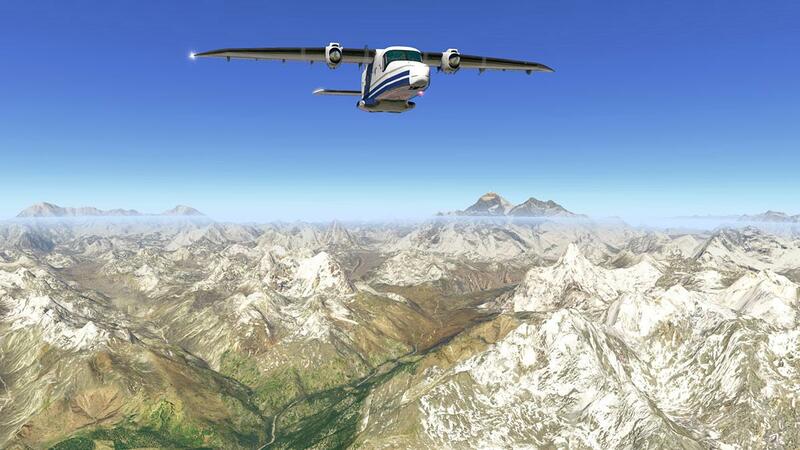 But note that FL290... that is a normal flight height on any short main route around the world, say in Europe, and with that aspect in mind you can feel the sheer size of the mountain. 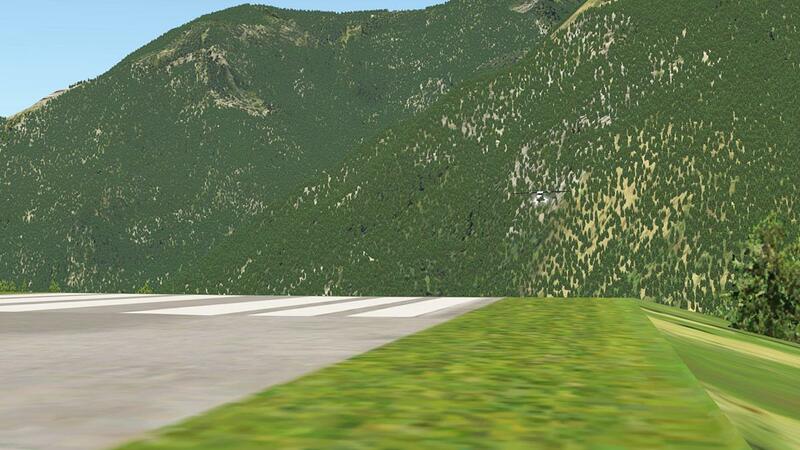 The hard part is getting up to that flight level, and that is just to gorp at the mountain. Another aspect is the type of aircraft to use up there in that thin air, A jet is more than capable but it is too fast, and there are not a lot of props with the power to operate in the area, most will use a helicopter, but be aware of the aircraft's limitations at these altitudes, so my choice (quite wisely) was the Carenado Do228. 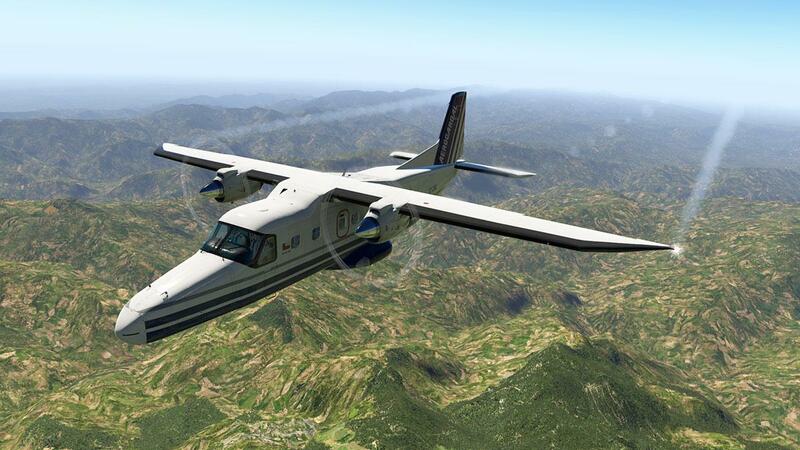 It is a very popular aircraft for this area, and used by all the local operators, but it still has a 7620m (25 000 ft) ceiling and here you are going to use every inch of that. 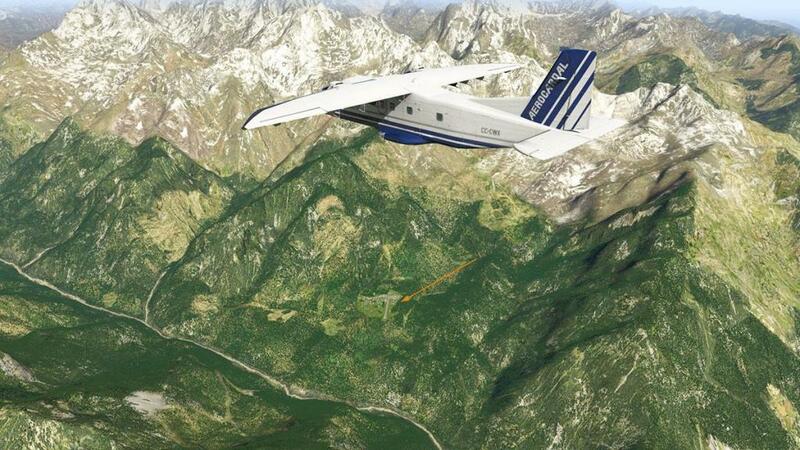 I am going to show the X-Plane local Map of the route, it has to really be all VFR, you could create a FMS route, but I don't think you would have enough waypoints to make it safe, there is a lot of directional changes you will be doing anyway to try to automate the route. I worked out the fuel required by time and distance, I wanted to find the best balance in having more than enough and I ended up with 4500kg or 9900ibs, without the weight of full tanks for safety. 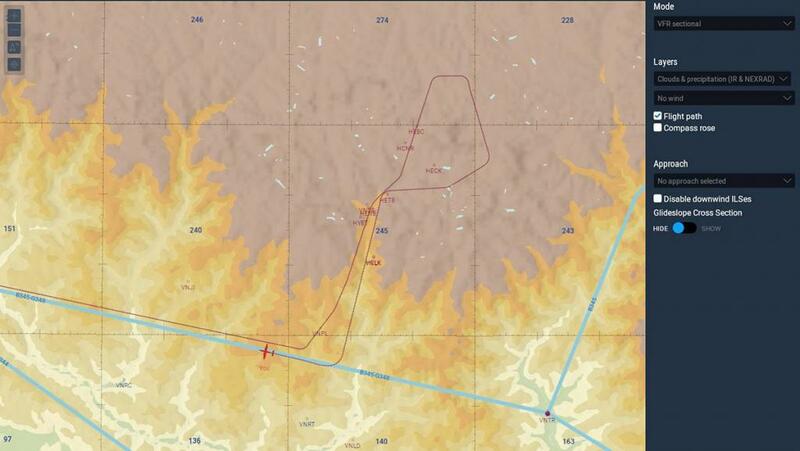 But flying into areas like this is a bit like going out over the sea, as once airborne there are limited areas or places to land or to find safety, and that has to be taken into account for margins of error. 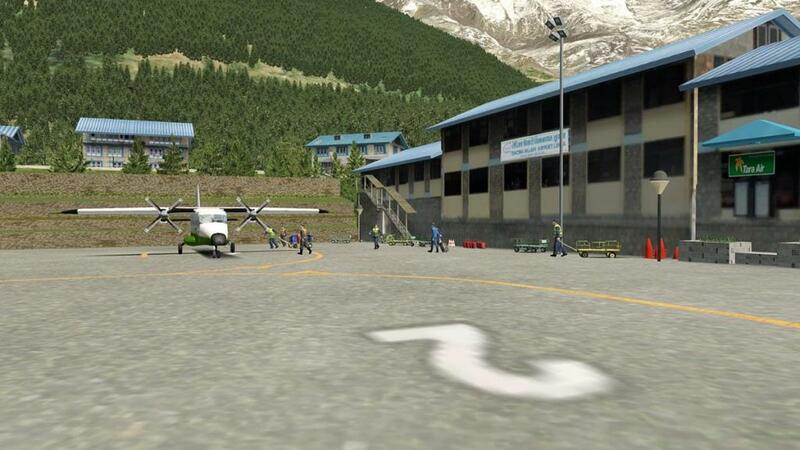 I dug out a very old VNTK - Kathmandu Tribhuvan Intl. But I have absolutely no idea where it came from? 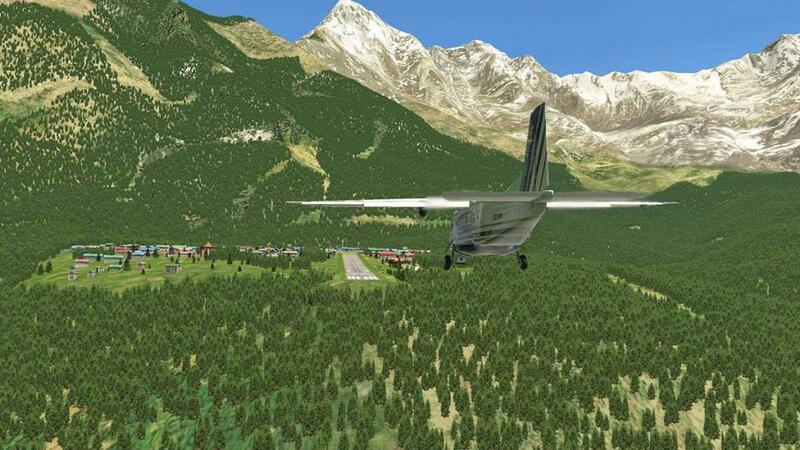 but there is a global airport version built into X-Plane. There is also a rumor that Cami de Bellis also did a VNKT? 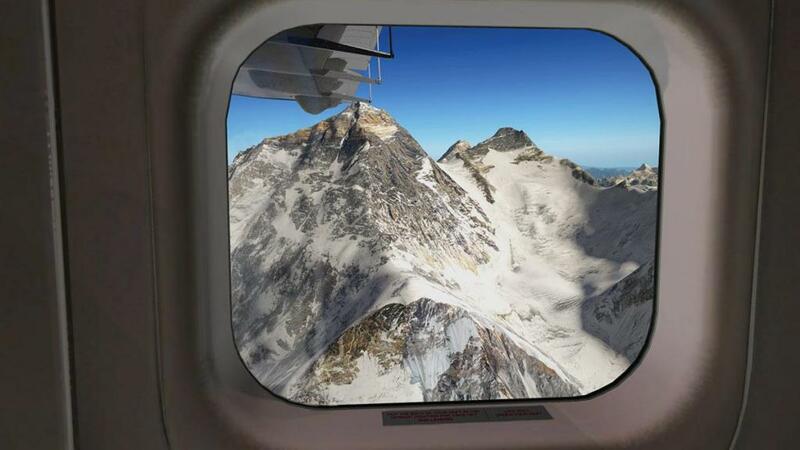 Even sitting on the apron at VNKT, you can see the Everest 3D Park scenery as the Himalayan range is very visible to the north. VNTK is tricky as well. It sits at 4400ft, but Katmandu is sitting almost like in a crater, and you need to climb almost straight up out of this hole to clear the surrounding walls of mountains, hills are maybe a bit of a stretch, as you need to climb at least 12,000ft straight up in a short distance, I am going to 18,000ft. 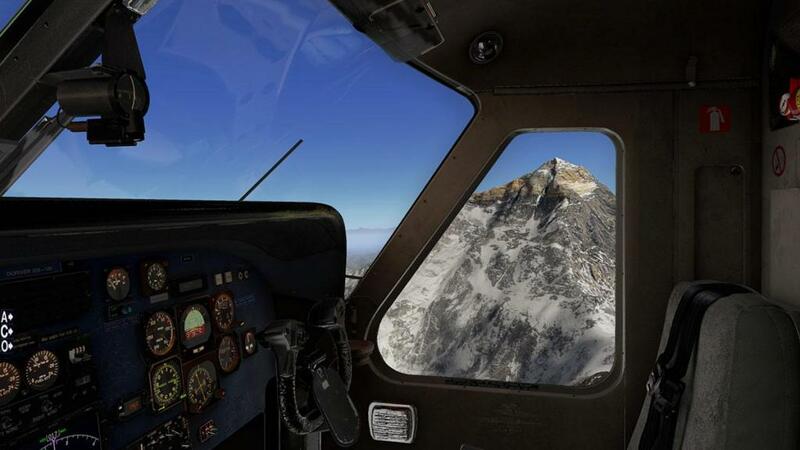 An early note is you have to choose if you are either going to fly to Everest the mountain, or to VNLK - Lukla at 9,334 ft/2,845m instead because the differences in altitude between the two are quite substantial. 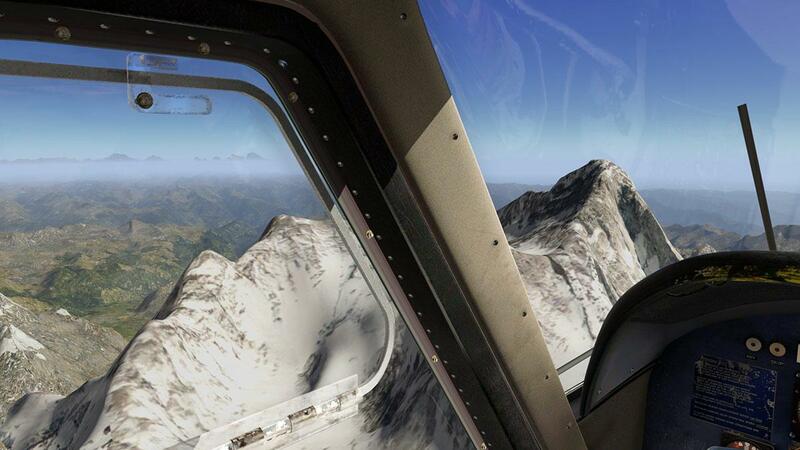 So all you do is climb, climb and do more climbing at a steady rate of around 1000fpm. 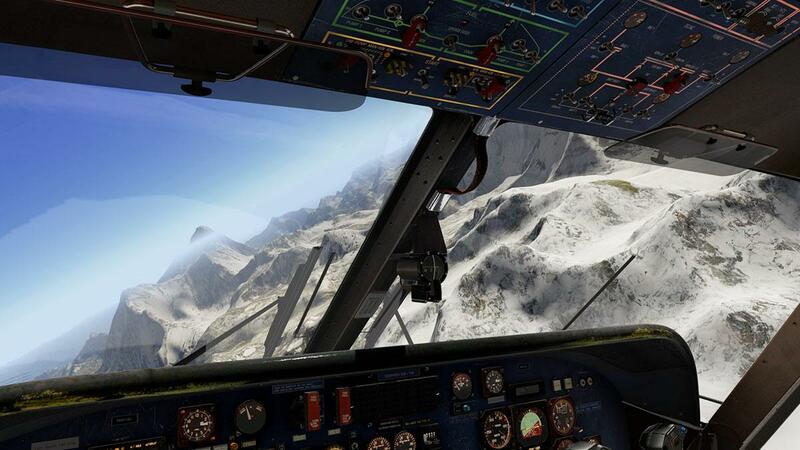 In climbing up higher and higher then the sub-range becomes even more visual, even at this distance it looks very realistic, even against the foreground default mesh. 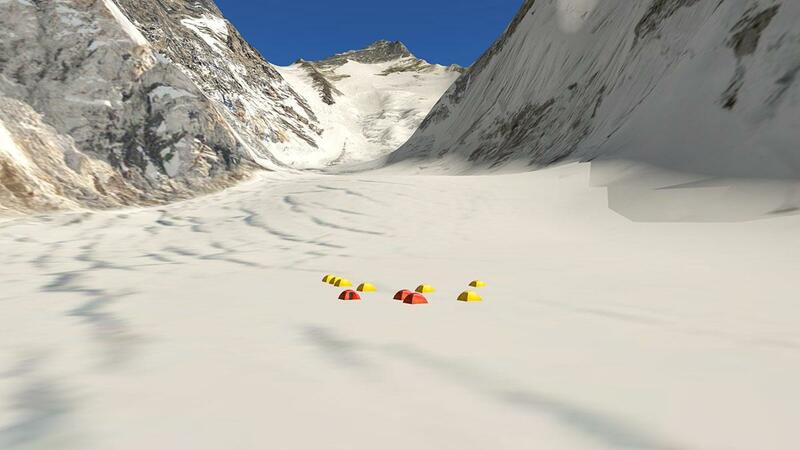 .... the crawl up to 18.000ft was a slow and steady climb, but finally the gap to Khumbu Valley finally opened up. 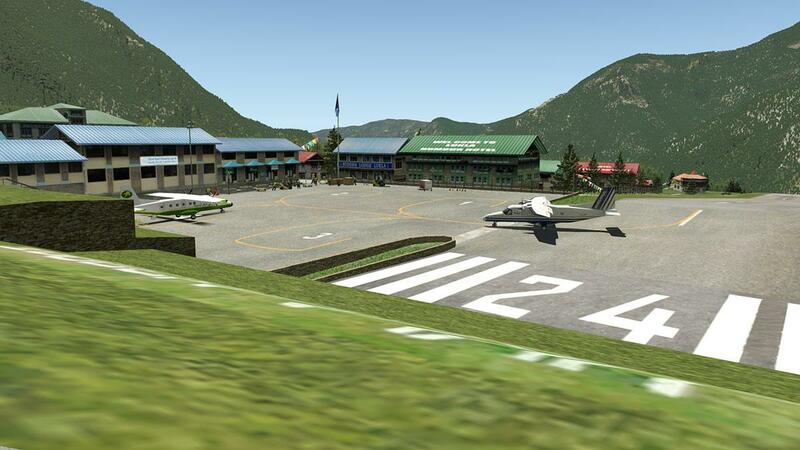 It can be very hard to find as it looks just like every other valley opening, but a clue is the airport VNPL - Phaplu Airport as it gives you a position to turn north. Once in the valley... you just start climbing again, but now you are targeting 25,000ft. 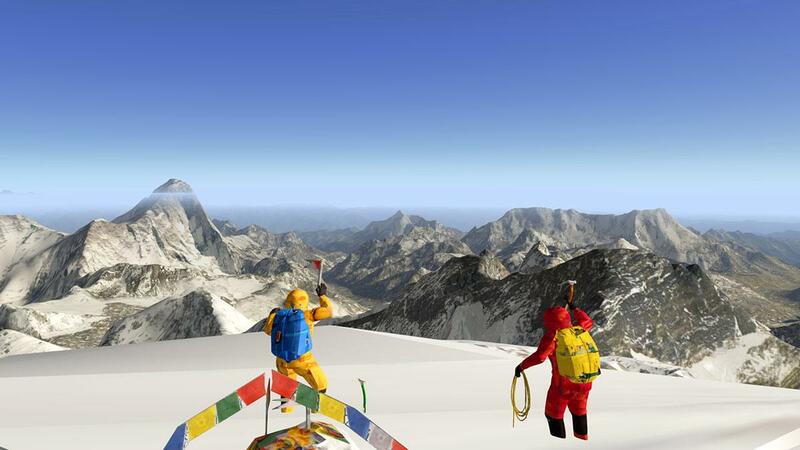 The outside temperature is plummeting as well as you go higher, and already it is below -20º and by the time you get to Everest it will be -40º, and simply that is why you die out there. 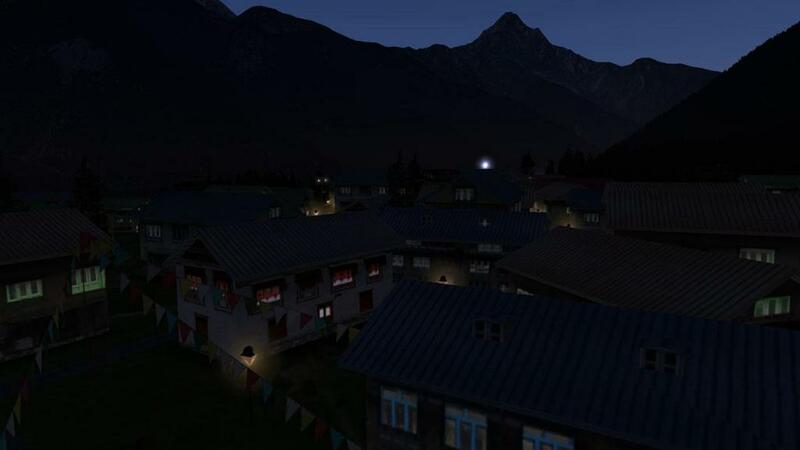 As soon as you move into the valley then Lukla is on your right far below (arrowed)... 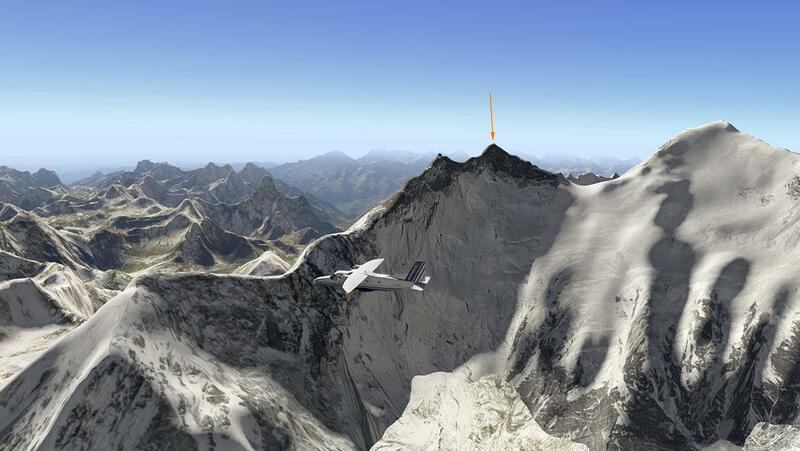 Note that distance in altitude? 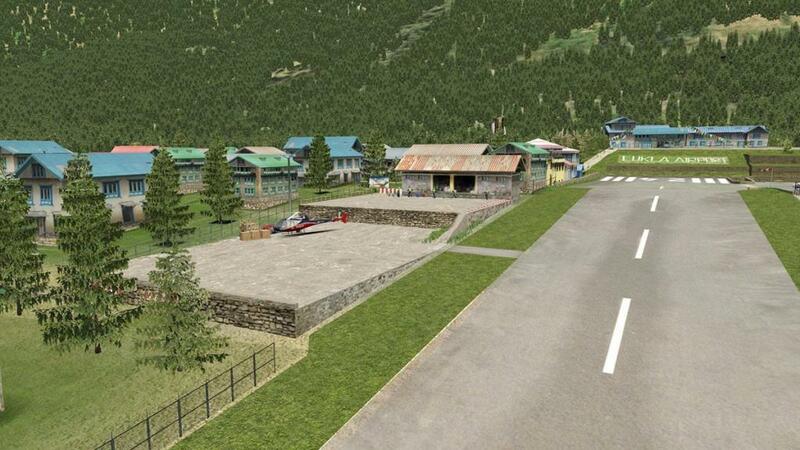 Namche Baza at 3,440m is set higher and not too further down the valley on your left, note the grass/gravel runway that is set above the village. 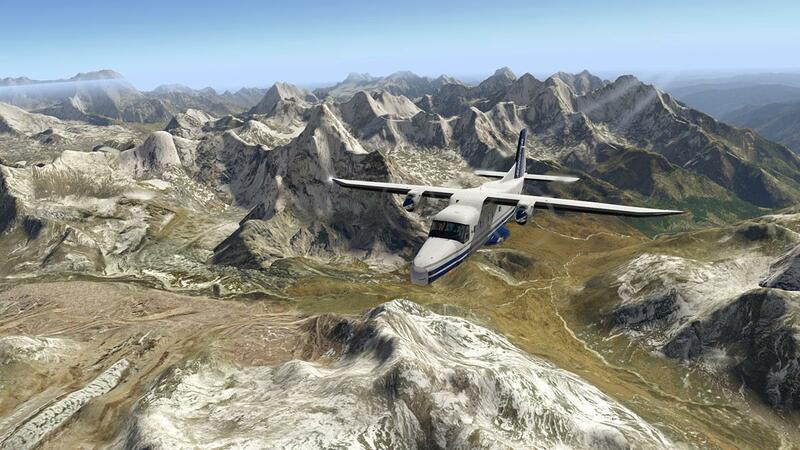 Finally Sagarmatha fills the windscreen. 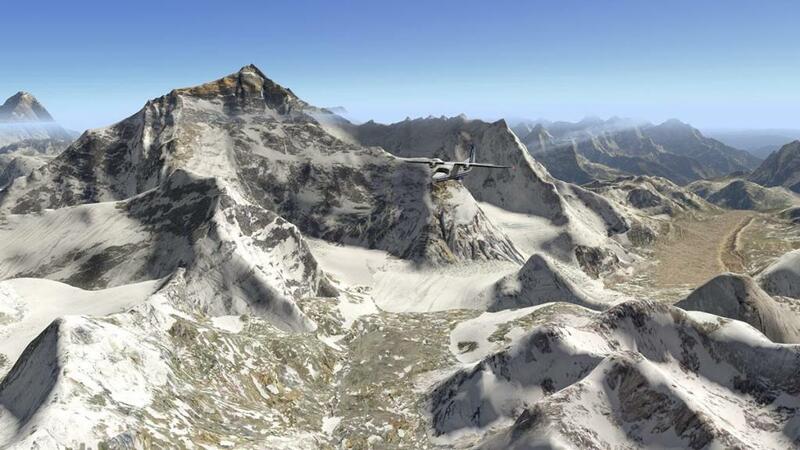 The valley floor, the immense Khumbu Icefall... and the twin peaks of Lhotse and Everest itself. 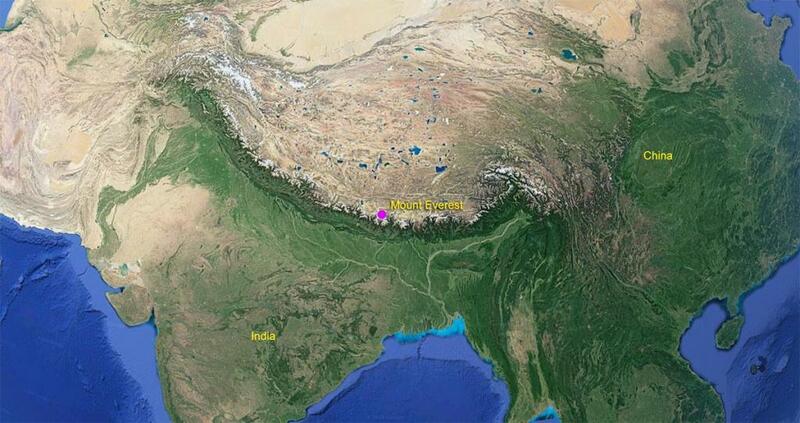 ... the area covered is huge and very spectacular. 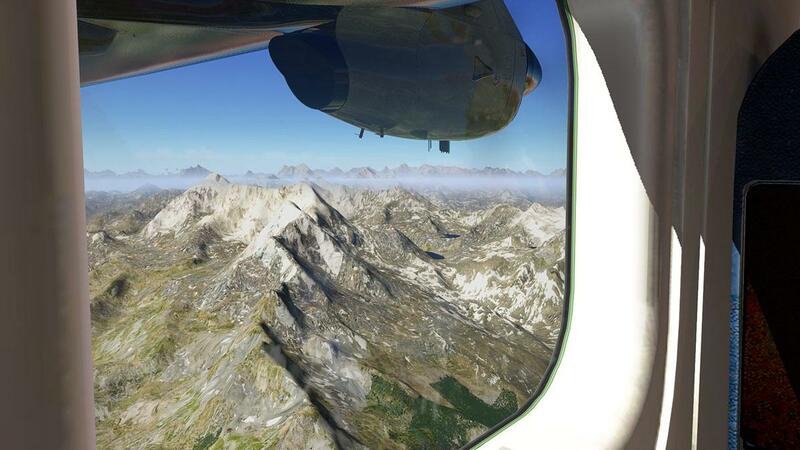 Looking through the aircraft's windows gives you a more high feel of the detail available here. 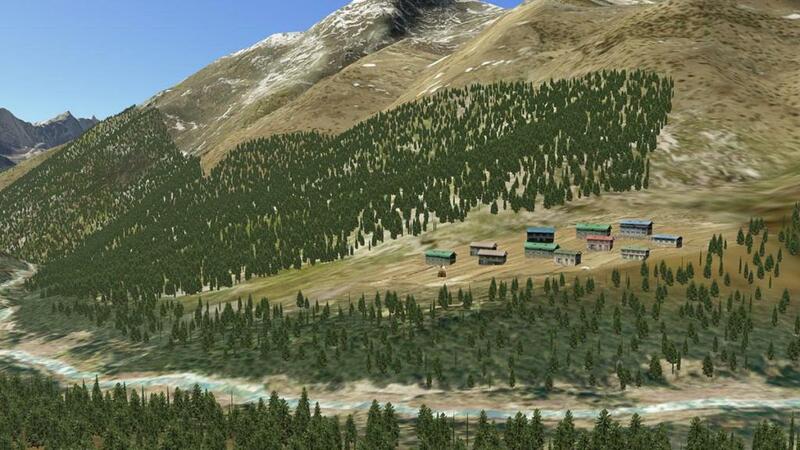 All the scenery is 3D and according to the DEM data (digital elevation model) and further elaborated with many structural details. Many textures (over 40) are based on 4K (4096x4096) extreme quality images. 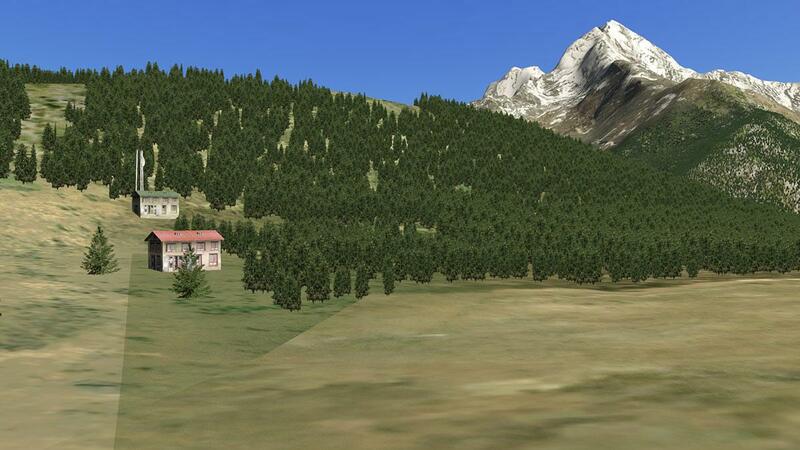 Moving around to the north (Chinese side) and it the visual aspect changes quite significantly, you could call it the "back side of the mountain", it never was as very photographic or dramatic as the Tibetan side, and could be noted as just mountainous. 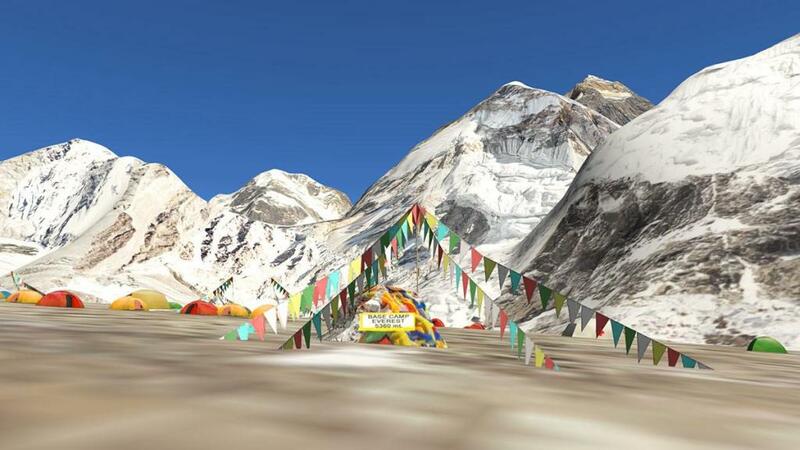 Lhotse (8516) (arrowed below) is right next to Everest, but to the east is Makalu (8463) which is just as dominating as the main attraction. 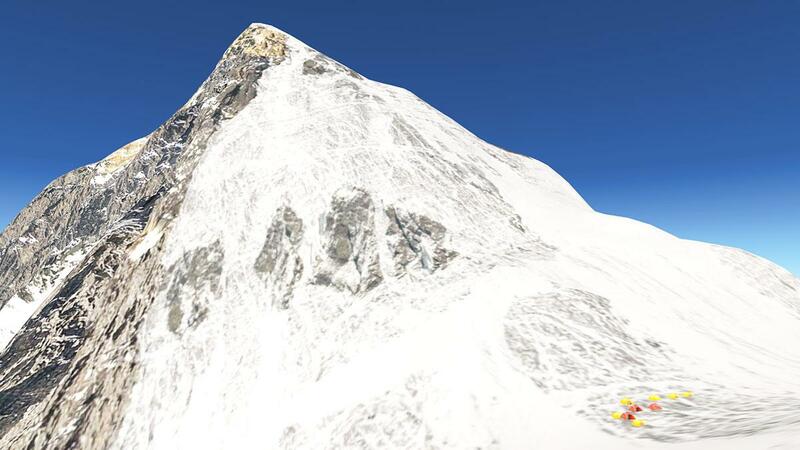 I feel I am just a little too close to the peak of Makalu, but the weather today is fine, but I wouldn't try this in poorer visibility. Heading south again you are looking for the doorway between Tobuche (6543) and Ama Dablam (6812). 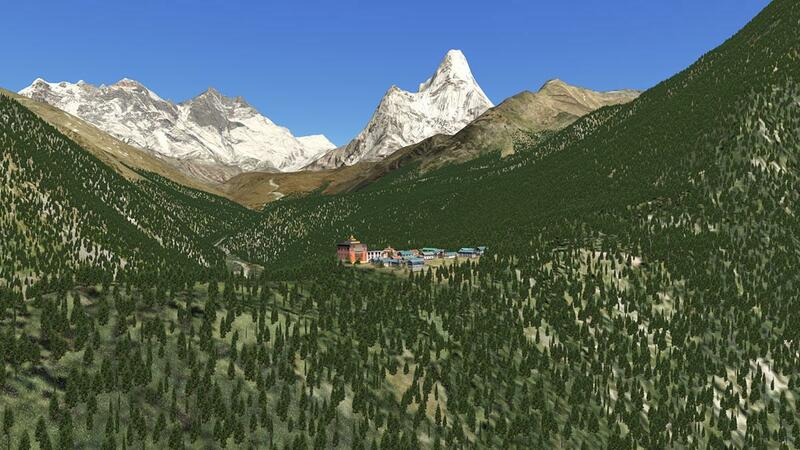 And with one last look left at Everest I turn back down Khumbu Valley with Ama Dablam just glazing to my left. Moving away from Everest and you are making trails back to Katmandu, there is only one thing to do now... and that is to go all the way down again, and at least it will be far, far faster than when you were clambering and coming up here. 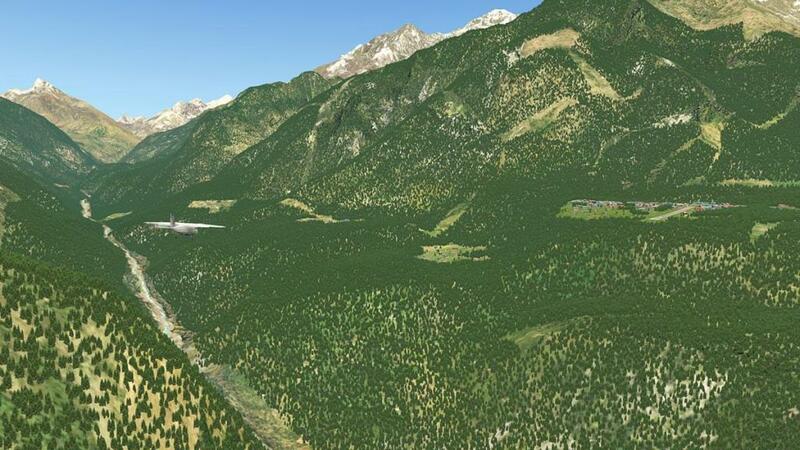 ... a view of the mountain that many climbers have seen, and know they will be going up there tomorrow. 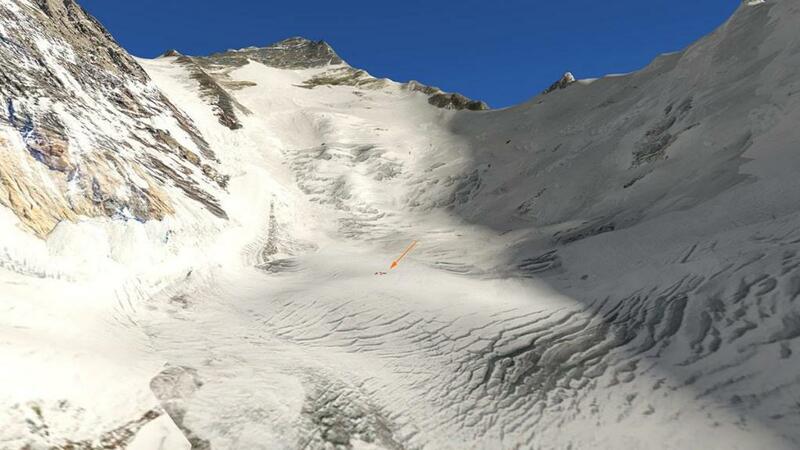 The usual route up was via the Khumbu Icefall or icefield. Which is really a river of deep frozen snow. It was in many ways it still is the most treacherous parts of the ascent, with open crevasses, rock falls and the odd Avalanches. 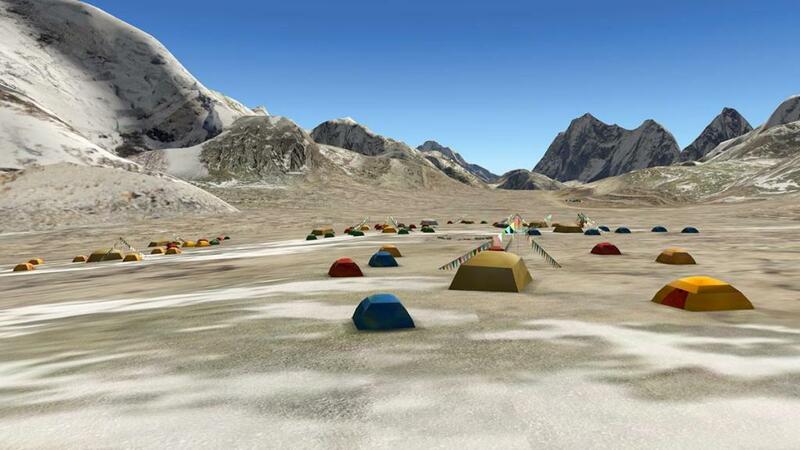 Camp 1 and camp ll are simulated as is camp lll (arrowed), then get up to the South Col and one of the most photographed views in the world comes into view, the aspect is looking east towards Makalu and Baruntse. 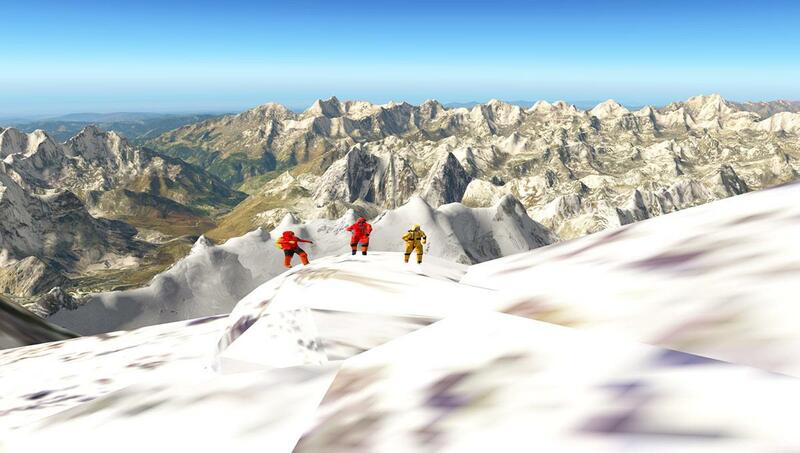 The South Col is also known as the "Death Zone" or the depletion of oxygen at 8,000m (26,247ft), and many climbers are still here buried in the snow, like Rob Hall from New Zealand who was leading the1996 Mount Everest expedition in which he died trying to save a customer climber. 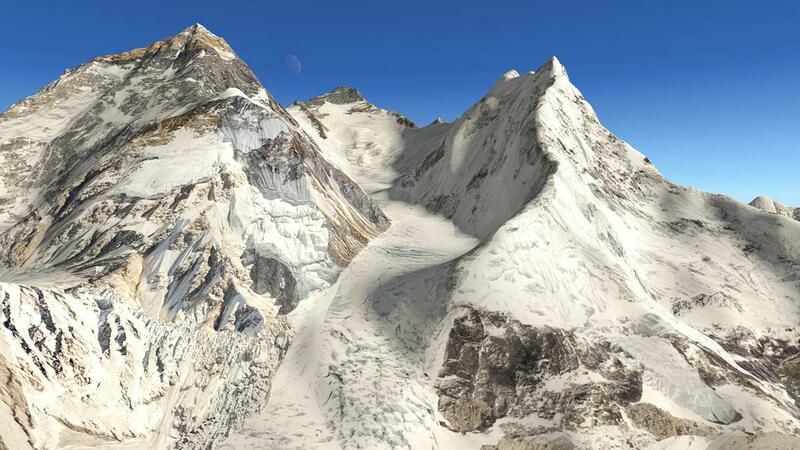 The mountain's detail is exceptional, certainly in the different layers of time built up rock, this is the certainly the most authentic representation you will ever get of Everest, and you can feel every niche of this formidable rock face. It has been hard to assemble the actual rock faces because there is no actual satellite images available, this representation came completely from photographic images. ..... the view up this high is however well worth all the effort. Streaming and falling back to earth, as only you can in X-Plane11.30. 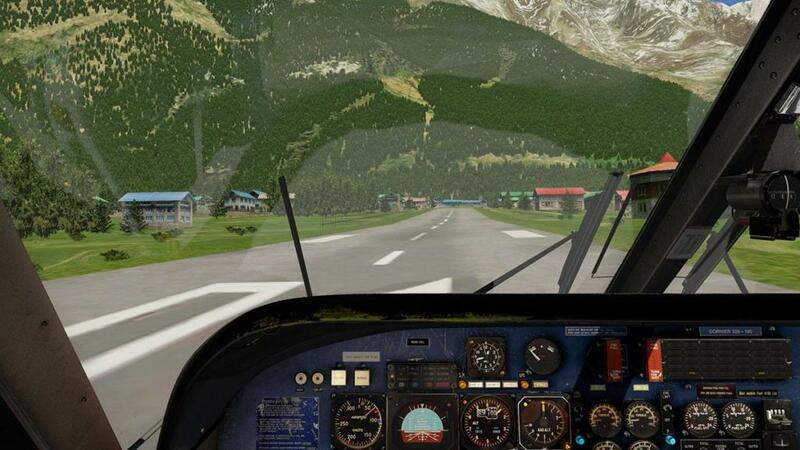 This airport is one of the most famous in the world and easily holds the title of "the most dangerous airport in the world" and the attraction for any simulation is just to take on the "the most dangerous airport in the world"... it is a no brainer there. The strip (if you can call it a strip) was built by the great man himself Sir Edmund Hillary back in 1964, it was only paved in 2001, and so earlier on it was only a gravel strip. 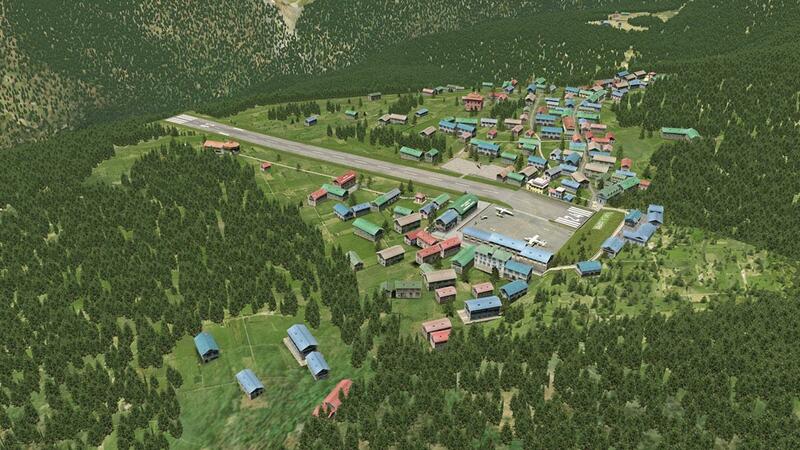 The runway 06/24 is 527 m (1,729 ft) × 30 m (98 ft) with a 11.7% gradient, and the airport's elevation is 9,334 ft (2,845 m). It sounds easy but when you see that gradient in stu, then you can see the challenge, add in high winds along the mountain sides and with absolutely no go-around procedures, you have to land or do an early missed approach, once committed, your really committed. 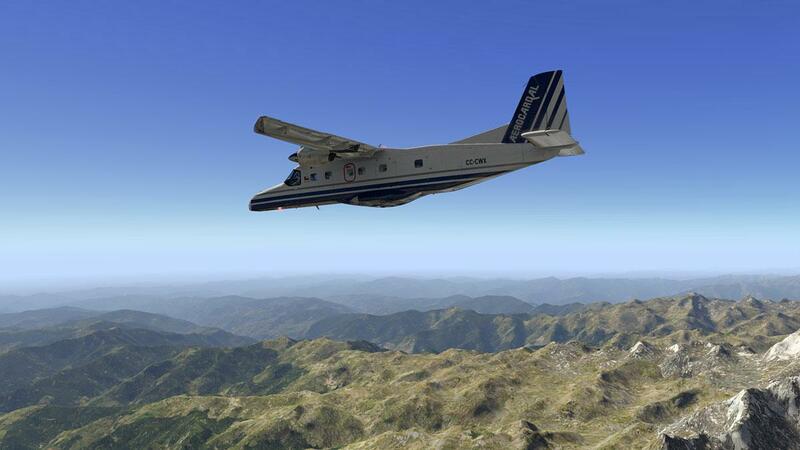 Certainly you are restricted to the type of aircraft you can use here and VNLK is accessible only to helicopters and small, fixed-wing, short-takeoff-and-landing aircraft such as the De Havilland Canada DHC-6 Twin Otter, Dornier Do 228, L-410 Turbolet and Pilatus PC-6 Turbo Porter. 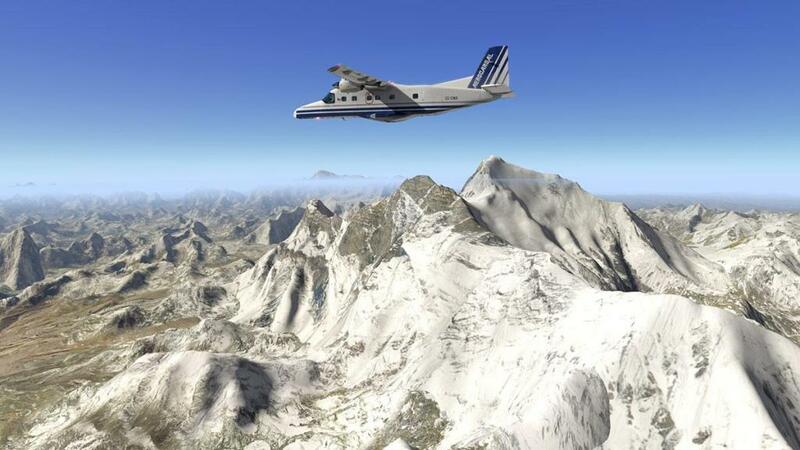 There are only four parking slots at VNLK and space is at a premium, and so the aircraft can get seriously busy at peak Everest trekking periods, then add in the weather factor. 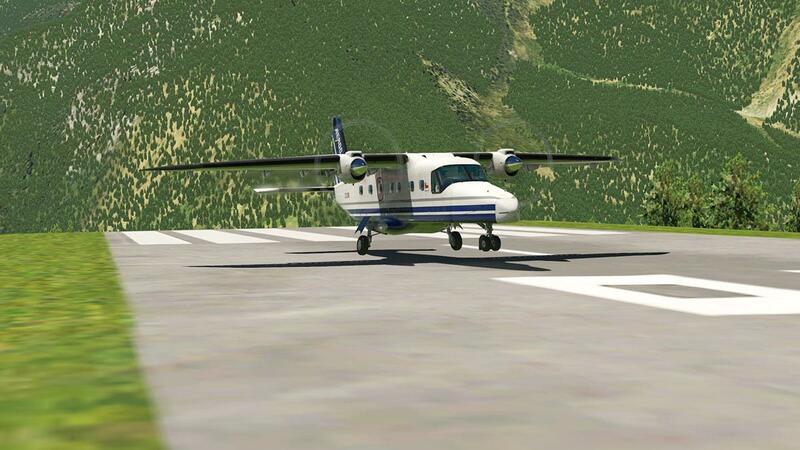 Most services are VNKT - Katmandu to VNLK - Lukla, and mostly it is a ferry service, but no doubt a brilliant experience. Fares are USD $161 each way and the flight lasts for 30min, which is a bargain really considering the significance of the route. 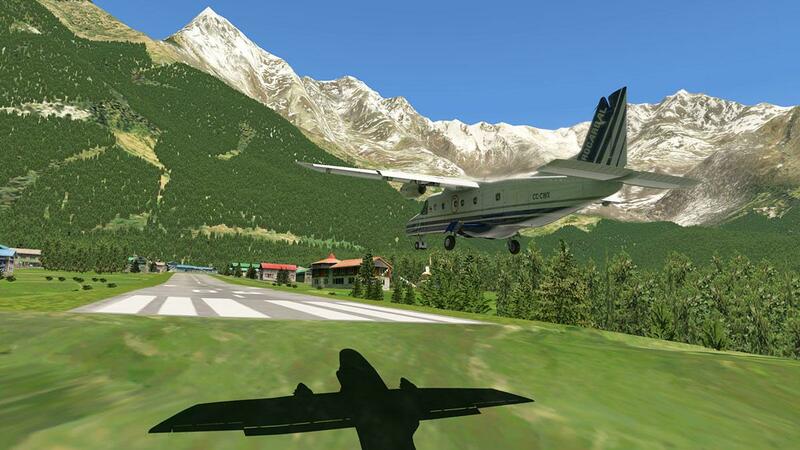 VNLK - Lukla as scenery has been in X-Plane for some time, but what we are looking at here is an authentic approach and a perfect representation of the runway and it's famous gradient. This aspect is not to taken too lightly as it is incredibly hard to model the scenery perfectly, in other words it needs an expert in mountain modeling to get the modeling right, that to a point it is what you are paying for here, the perfect experience of the hardest airport in the world to land in. 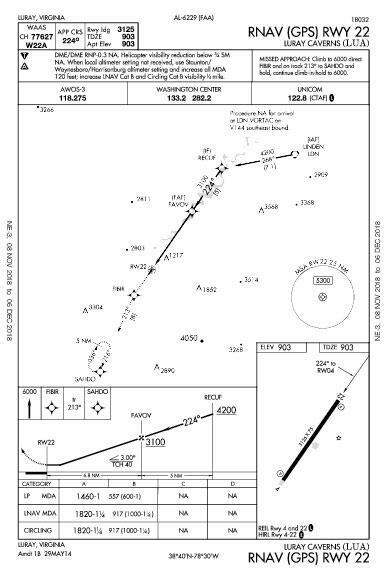 The developers do provide a chart for the best approach to RWY 06, and note the altitude numbers carefully, as to get them wrong is not just hitting something really, really hard... but to be in the wrong altitude in being too high or too low to get the correct approach path. 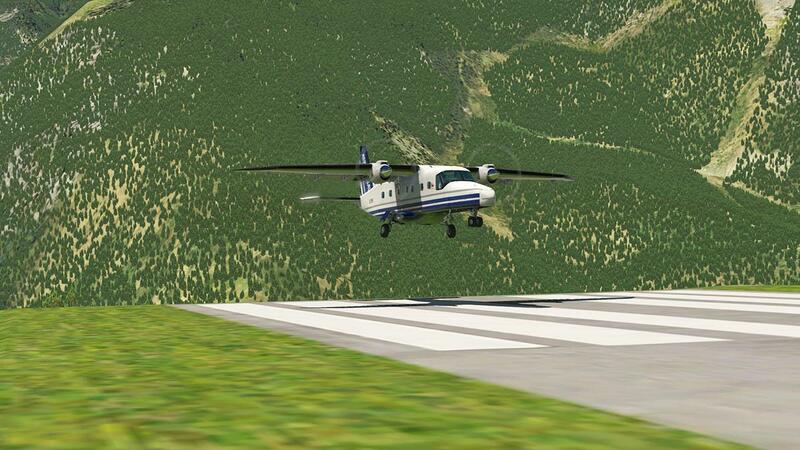 I have tried landing at VNLK a few times, and it is incredibly hard to get it right, you are looking for a speck on a mountain side, so a sort of dummy run is always the go if you are flying this challenge for the first time, the advances in the X-Plane simulator help a lot now as well, the aircraft are far better tuned to do what you want the aircraft to do... My choice of Carenado's Do228 was perfect and I recommend it highly with this scenery. Height and speed are obviously critical. 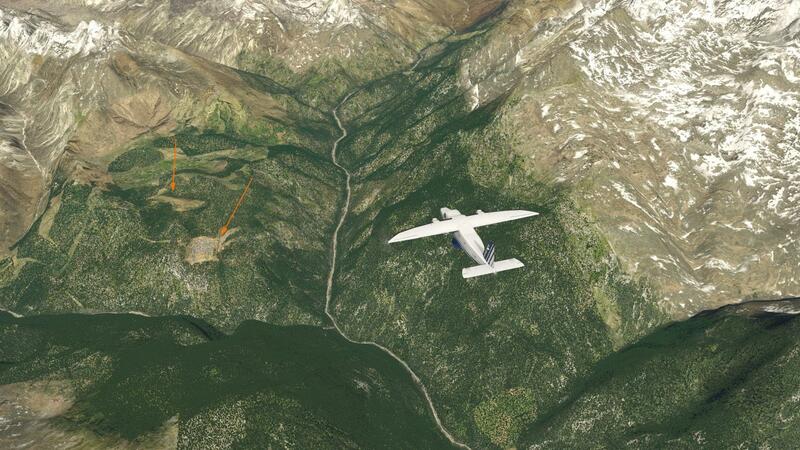 Speed is as low as you can get away with, without stalling down into the valley. 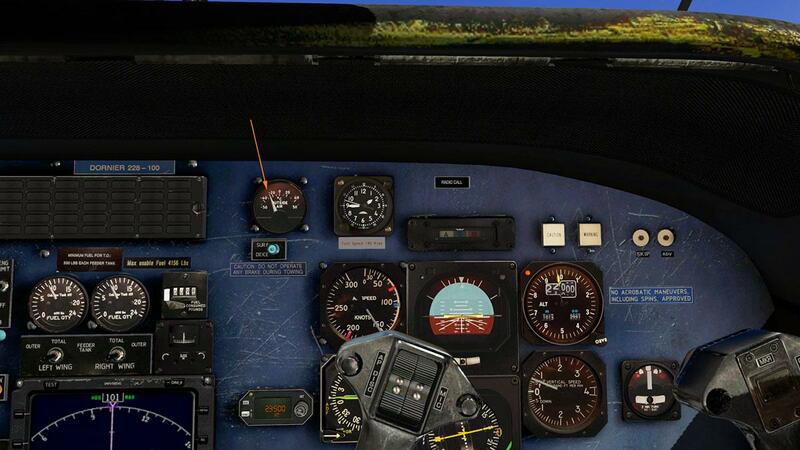 In the Do228 it is at 70 knts on the red line, full flap. 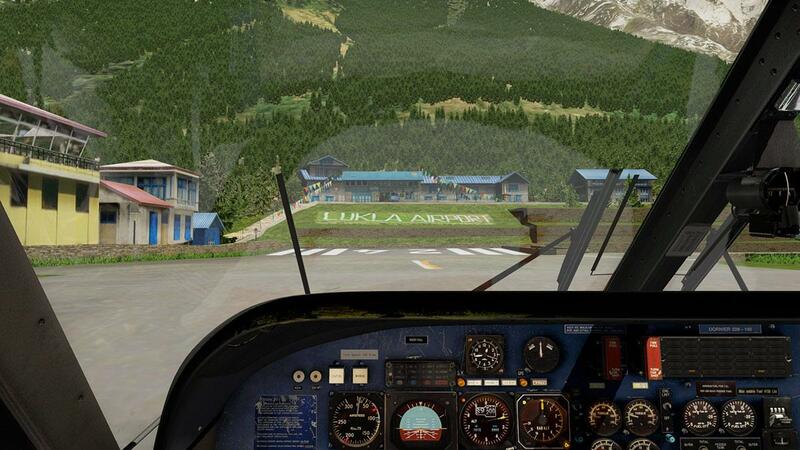 Lukla is 9100ft above sea level, so you need to be just slightly above that at 9300ft... and your aiming for the mountain side on your left to land at VNLK on your right. Once past that outcrop you begin a nice steady approach curve to the right. 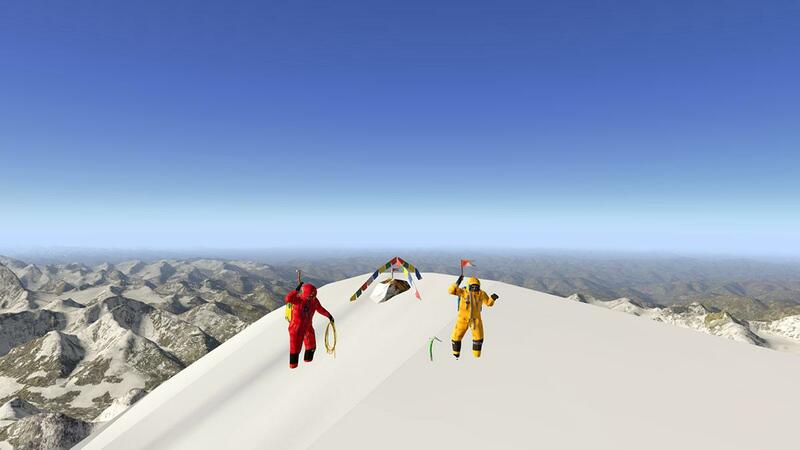 ... this is were the real skill comes in, and it can get very, very tricky. 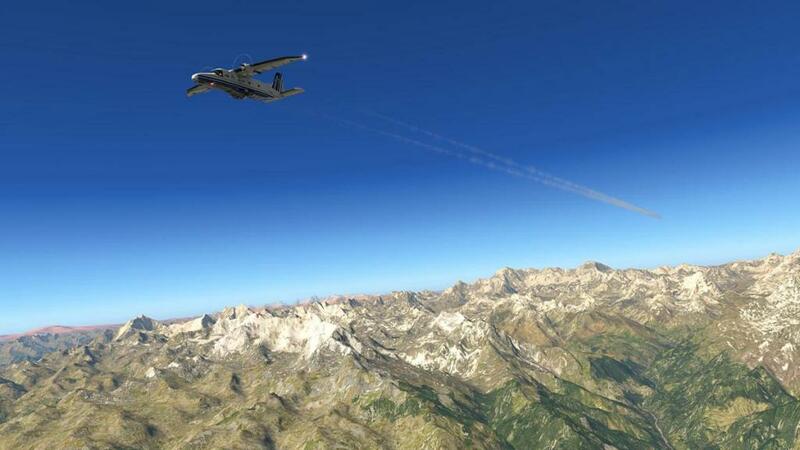 You are holding your breath, almost at stall speed at 60 knts, and fighting the aircraft... then that nice flare that has to be absolutely perfect. ... get that right and now all that thrust is now a liability as you kink over lip to the flat area on the top of the runway. There is not much space between you now and a hard wall! The pro's are amazing to watch on YouTube videos as the get all these sequence of actions perfectly in line to swing right into the small ramp area with four slots. It is very tight squeeze in here, and the poor turning circle that Carenado only allows you at low speeds, means I couldn't do the full 180º parking turn. Note the strong windsock, and up here when the engines are shutdown and the propellers are feathered, they still keep on turning at a high windmilling pace. The reproduction of Tenzing–Hillary Airport at Lukla is very well done and authentic, but the resolution of the textures are a bit low unless you can run your texture resolution at full settings, and that is tricky, because even if around the airport the textures are quite minimal... there is the huge amount of custom textures covering the actual Everest Park area adjoining. 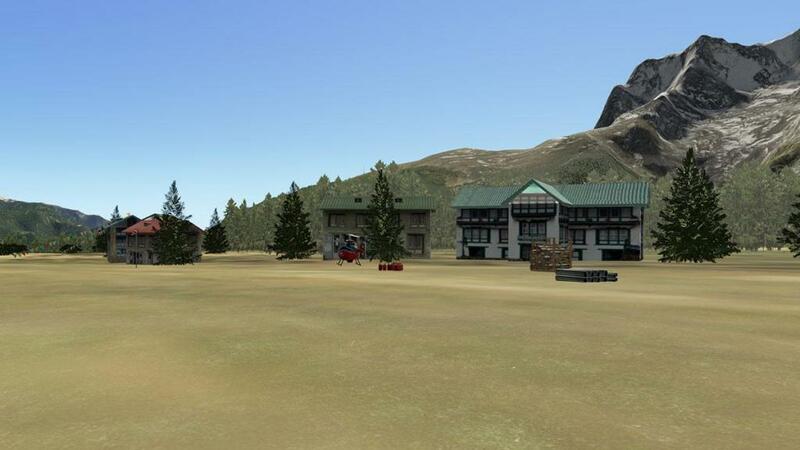 It is the same sort of feel and quality as the Matterhorn scenery, detailed, but not extremely detailed in a walk-around fashion. As a rule Lukla is only a small village, and although a major tourist hub, it is in most cases quite small. 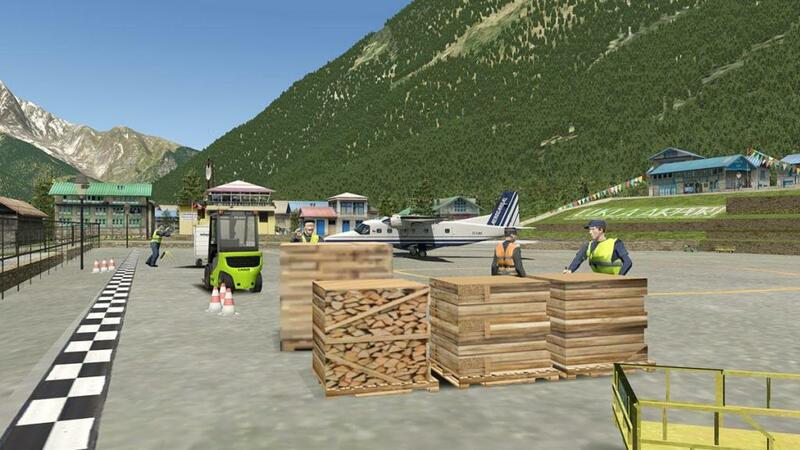 The area around the ramp is the most complex, and the airport terminal and ramp is very well done and highly detailed with some great clutter. 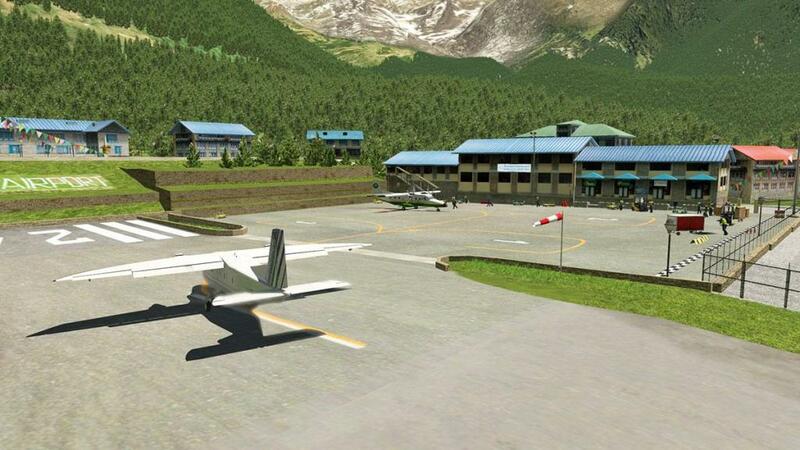 Note the largest hotel in Lukla is set directly behind the airport terminal. 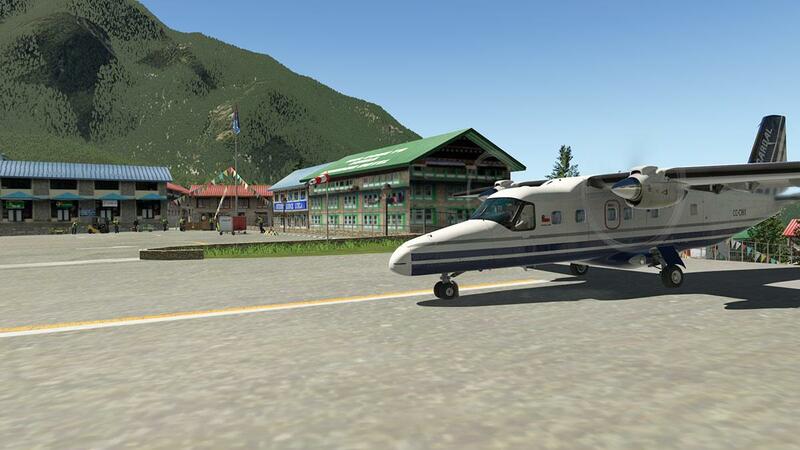 ... there is space to land two helios on the top level, and two with a static set on the lower, but there is no set X-Plane H landing pads? The control tower is more of a ramp tower, and in my version the tower view was not set (I has been done for the release version), but the tower is basic, but workable in a Tibetan sort of way. 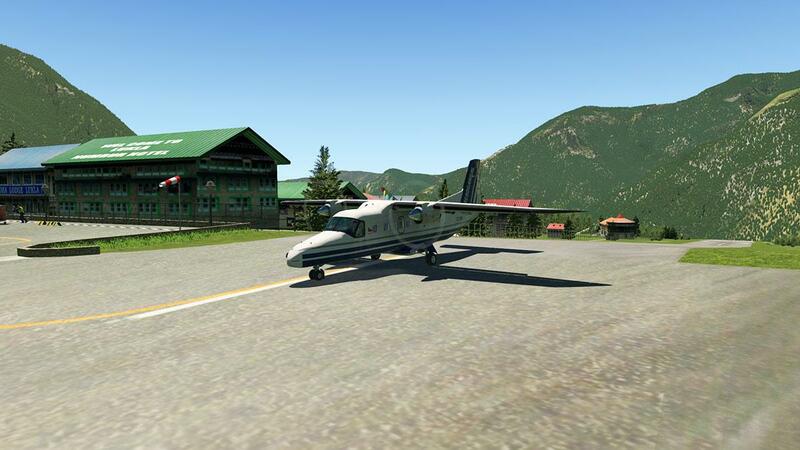 The famous Shangra -La Lodge and cafe is well done at the end of the runway, and the rest of the area is covered with Tibetan housing and small lodges with a lot of shrines thrown in. 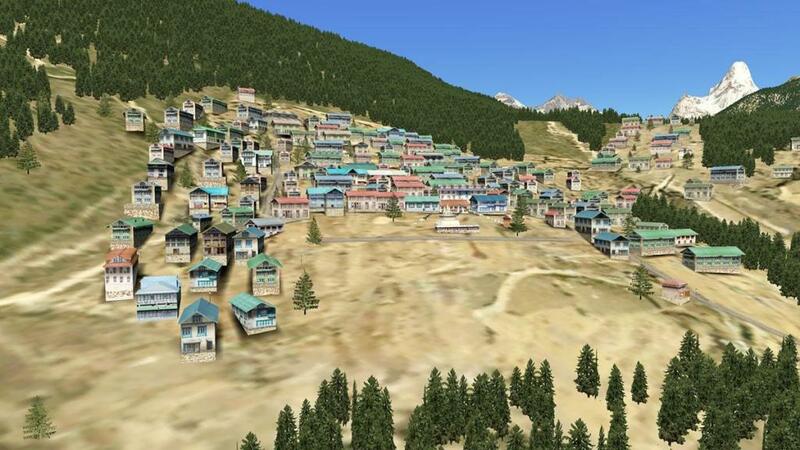 There is a very alpine feel to the village, but in a good way, but don't look for highly detailed Tibetan housing, it looks good, but it is still basic and well fitted well into the landscape. 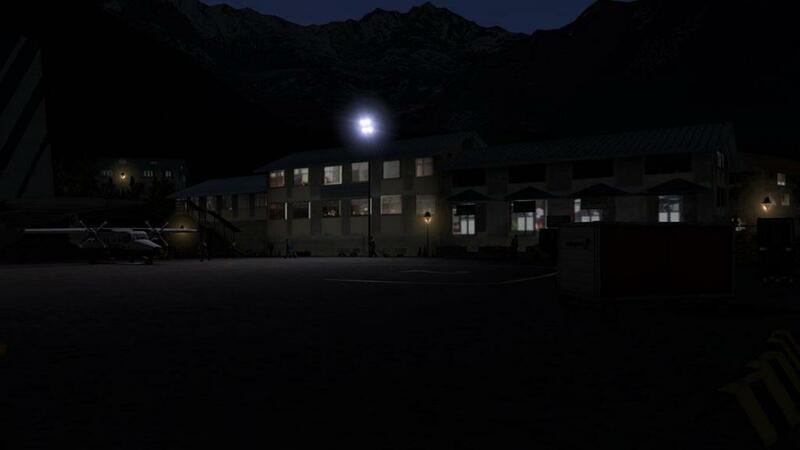 Lighting at Lukla is very moderate. Obviously night operations are out of the question, but there is a set of green taxiway lights up the runway is you want to have a suicidal try at it. 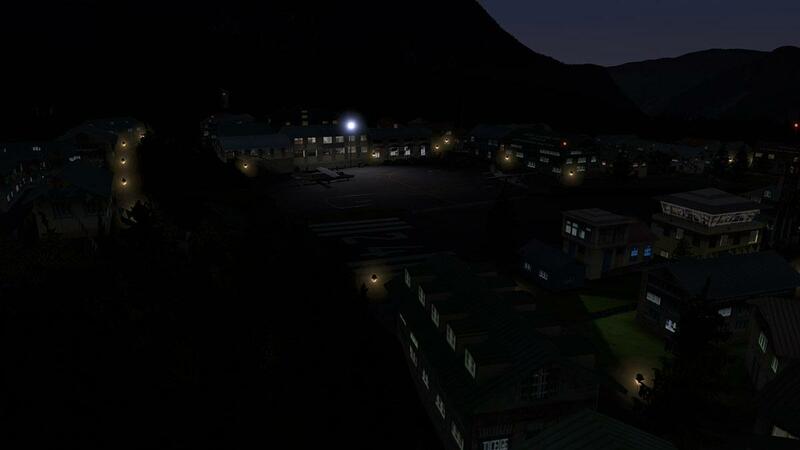 But the lighting does reflect the sort of feel you would have being up here surrounded by the mountains, watching dawn or dusk is a sublime moment, in a feel sort of way the scenery is very good. 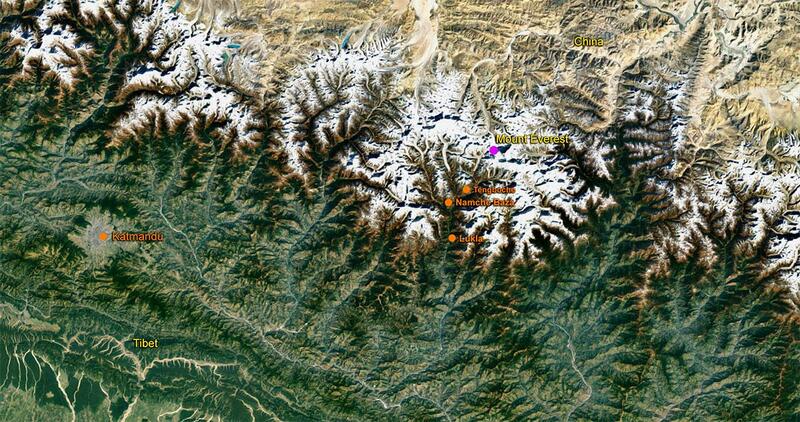 All three areas that cover Namche Baza, VNSB - Syangboche, Tengboche are close together. 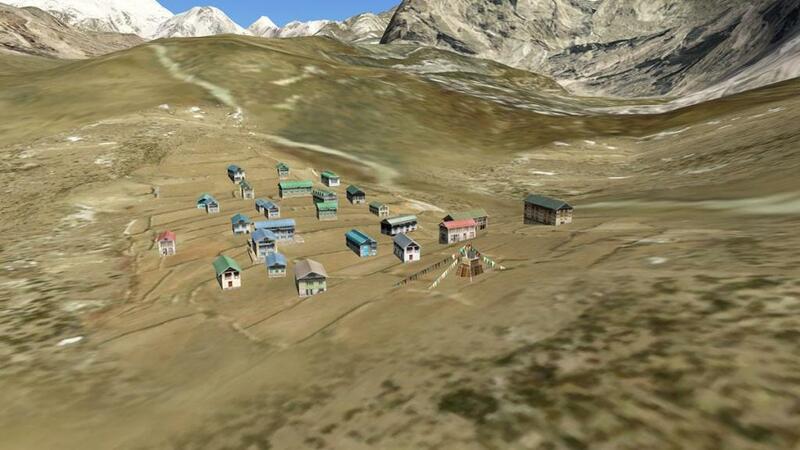 The village of Namche Baza is by the airstrip of VNSB - Syangboche, which is set out just above with the Khumjung small settlement set out on the flat level just behind. 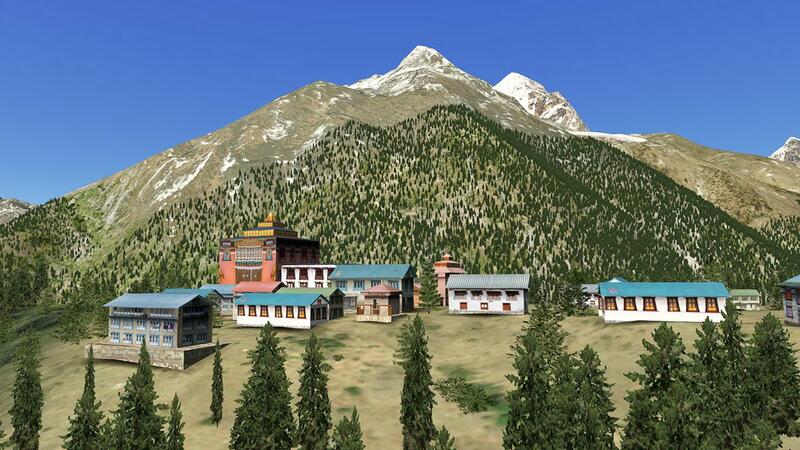 Tengboche and its famous Buddhist monastery is just across the valley further north. 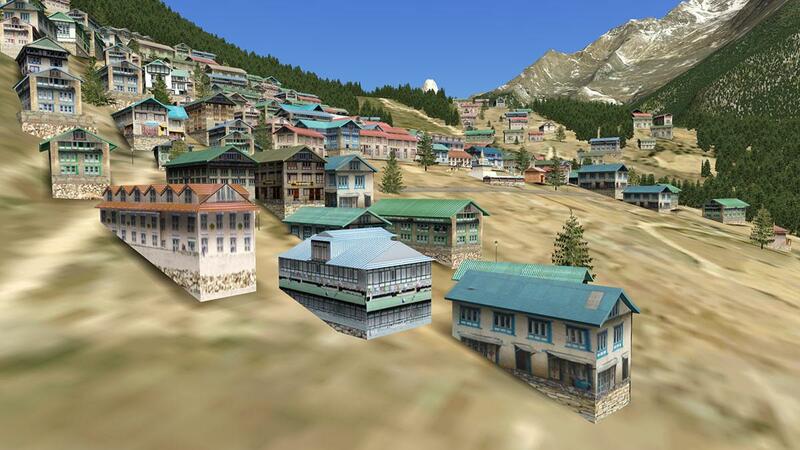 Namche Baza is just a typical if very famous Tibetan village and the layout is very similar to Lukla, but thankfully the all important shines were not forgotten. 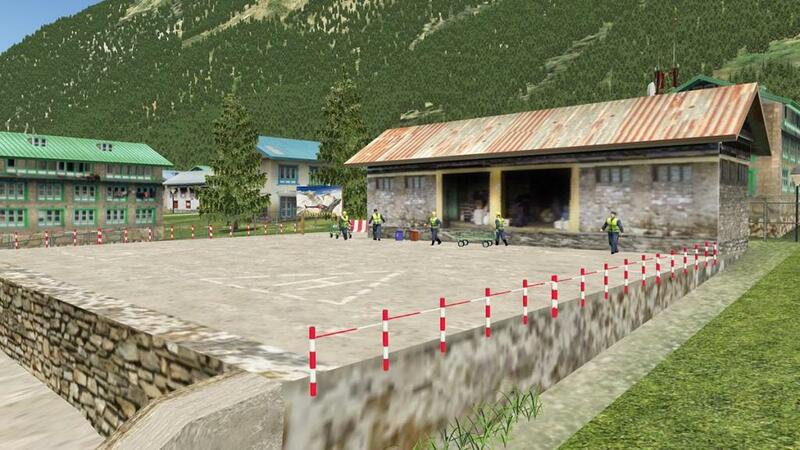 VNSB - Syangboche (IATA: SYH - ICAO: VNSB) Runway 1,312ft - 400m /Elevation AMSL 12,402ft /3,780m is an unpaved runway and is the closest landing strip to the Everest Base Camp, so it is a vital point to deliver to. 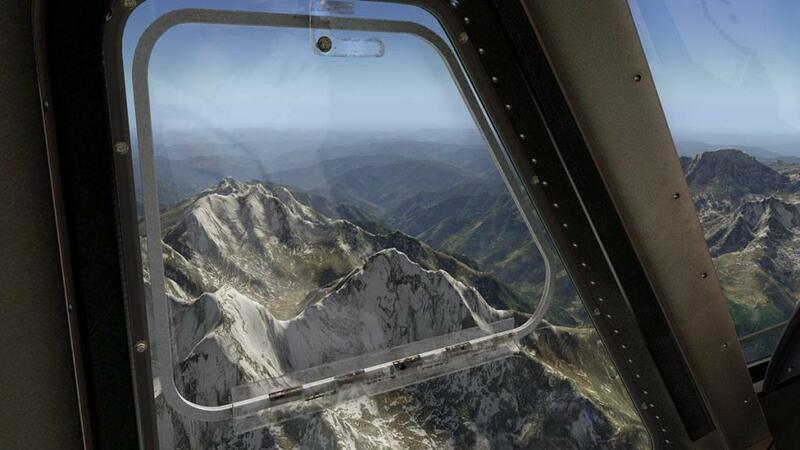 Most rescue operations are flown from here of the injured or for the required elevation acclimatization. 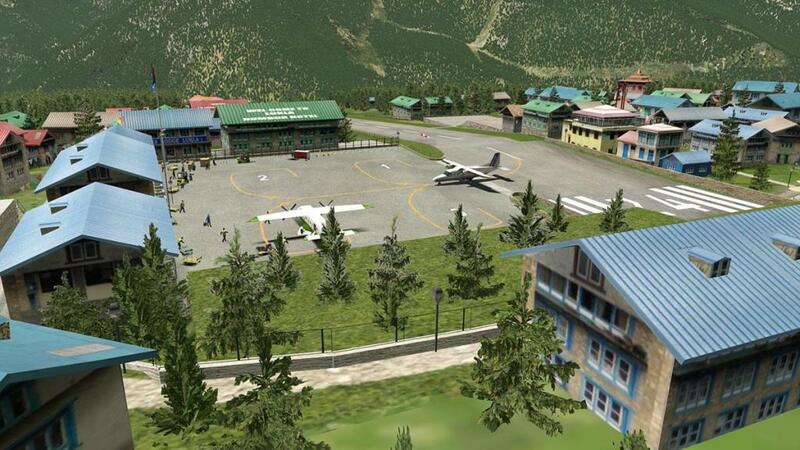 The Hotel/Terminal is basic, and there is a static helicopter and a little clutter to make it a worthwhile stop. 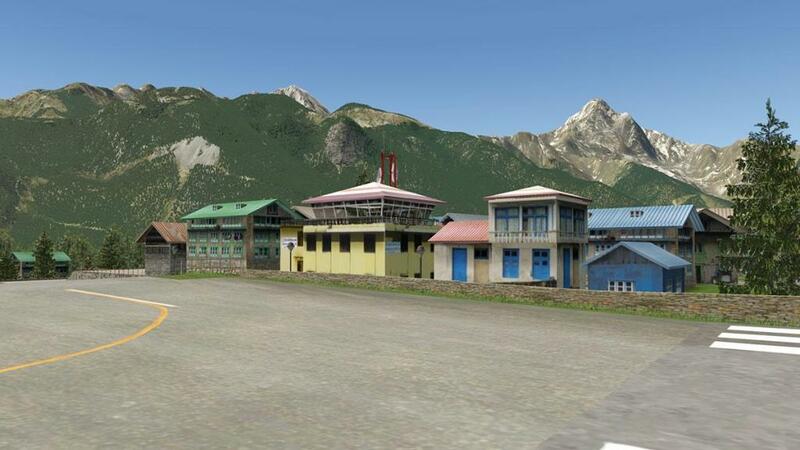 Up behind is Khumjung Village and the aptly named "Hotel Everest View"... Again there is sort of alpine feel to the area. 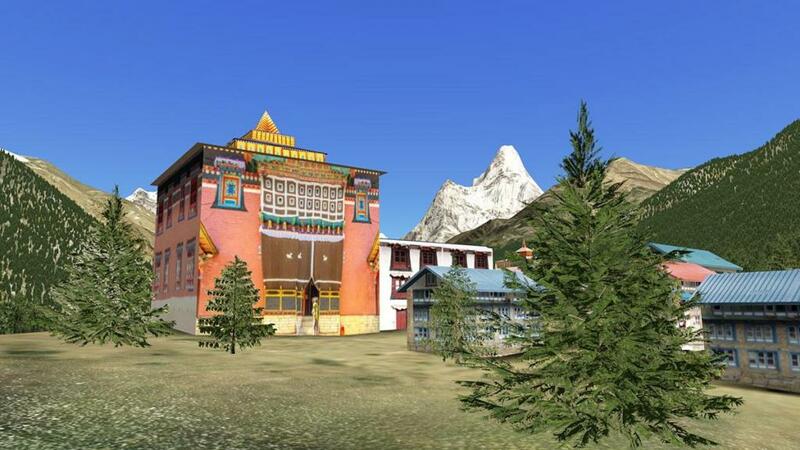 Tengboche and its famous Buddhist monastery is across the valley further north. 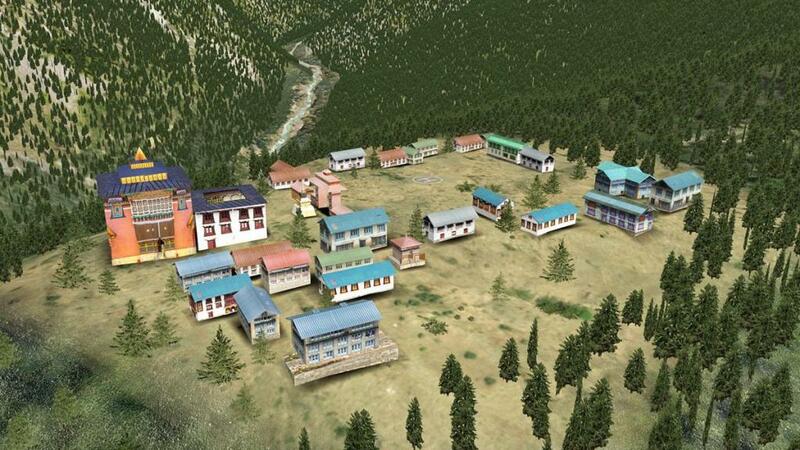 Tengboche and the Tengboche Monastery complex which is built around the village is considered to be the oldest Sherpa celibate monastery in existence. 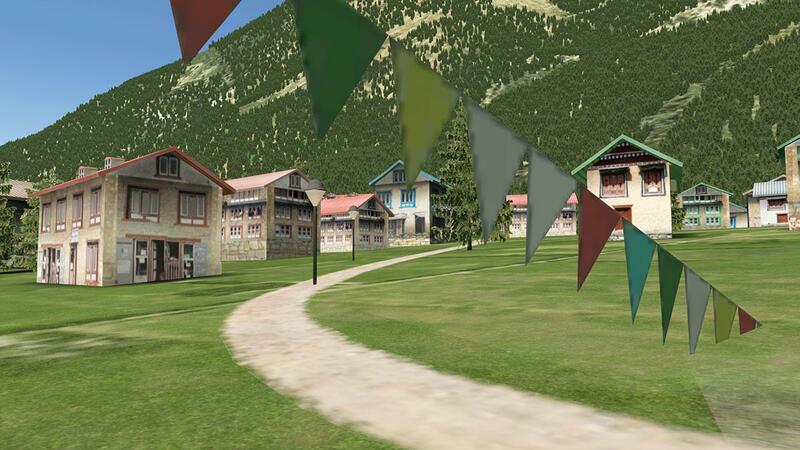 The rebuilt monastery is large and an impressive structure with a camping area in its front and with a number of lodges and shops.Tengboche is surrounded by the ancient mani stones (flat stones inscribed with the mantra, "Om Mane Padme Hum"), prayer flags flying atop the high peaks (flags are flown in 5 colours denoting the five Buddhist elements: earth, wind, fire, water and consciousness. The courtyard and storerooms are large to facilitate the monks' religious rites and activities. 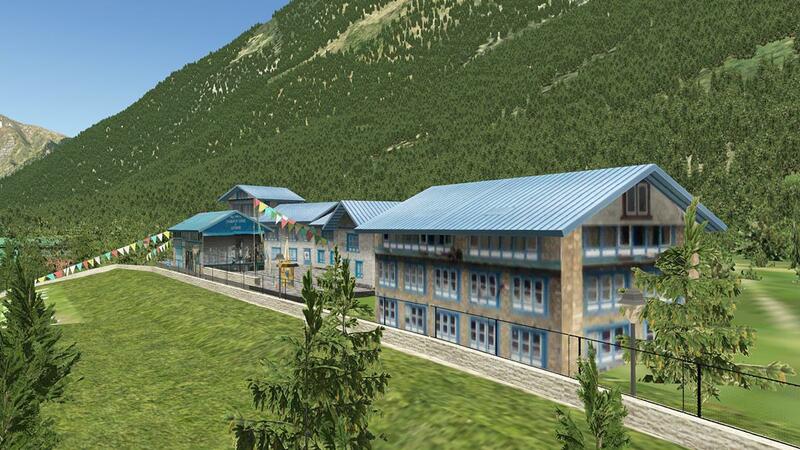 The main building has the mandatory Dokhang, the prayer hall, where a large statue of Shakyamuni Buddha is deified. The statue extends to two floors of the monastery and encompasses the "Ser sang lha khang", the first floor shrine room. Sakyamuni Buddha is flanked by Manjushri, the deity of wisdom and Maitreya and of the future Buddha. 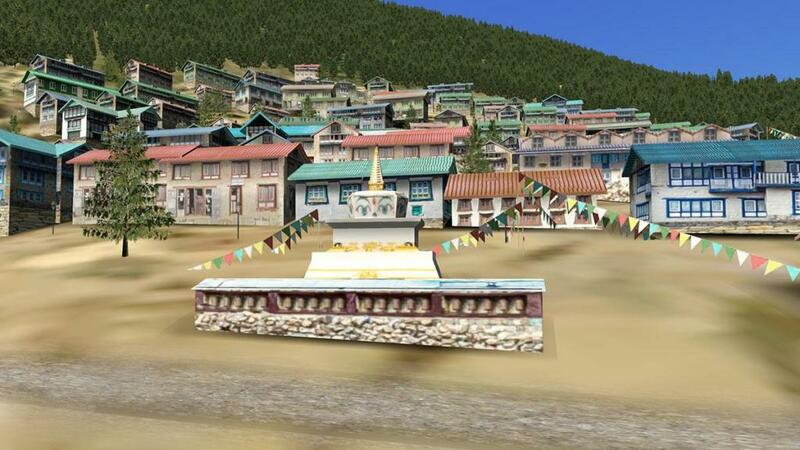 The scriptures of the Kangyur, the original teachings of the Buddha translated into Tibetan are also part of the sanctum. In small areas set around the scenery are other resting lodges to cover the trek route to the Everest base camp, and these are represented as well. 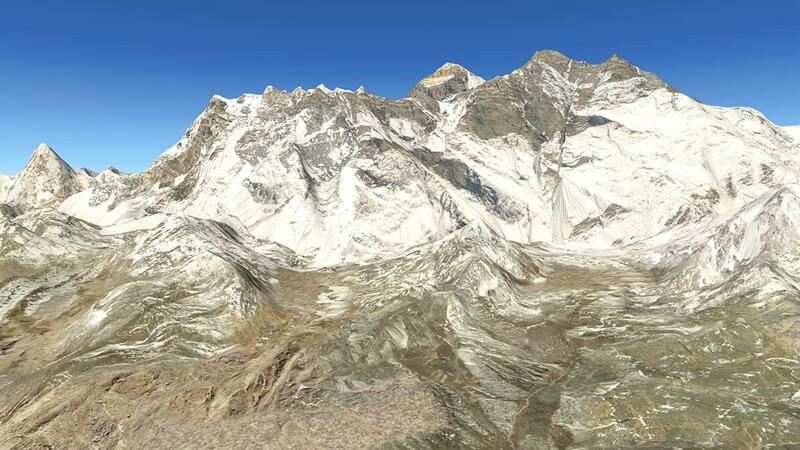 The only thing missing is that plume of icy wind from the peak of Everest... maybe that with the new 11.30 particle effect generator that could, be done as well? 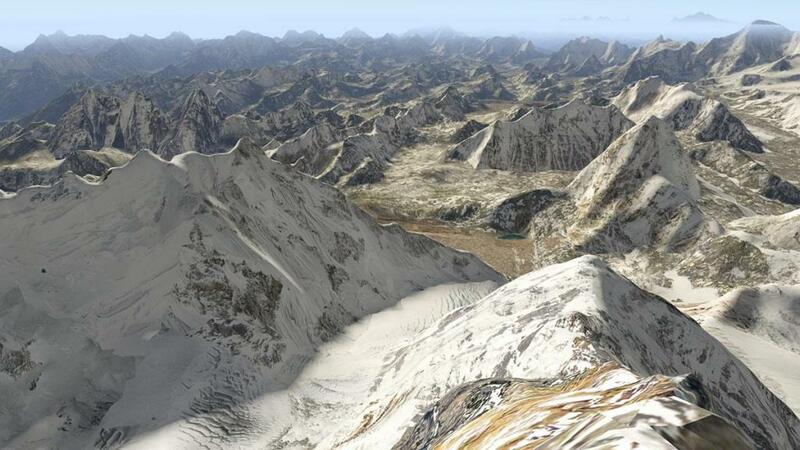 even so it is still all very dramatic.... the "Roof of the World". It is a strange feeling... 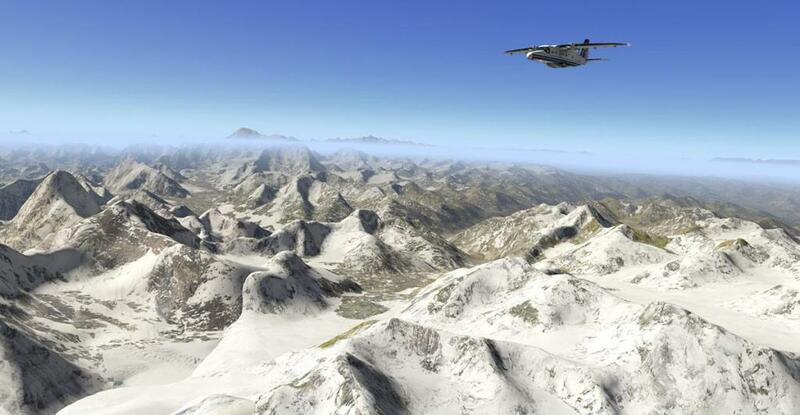 If you have invested in Frank Dainese & Fabio Bellini's spectacular sceneries and they are part of your X-Plane scenery, then you get this sort of completeness. 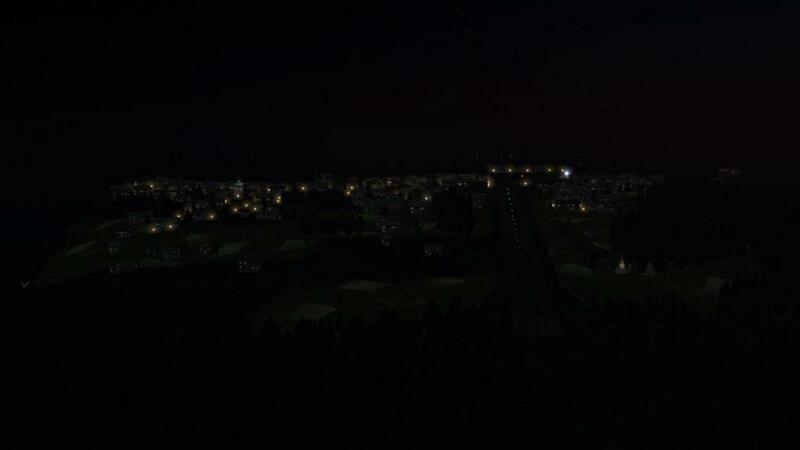 No airport, maybe a large city scenery, but not on a scale like this do get that feel your X-Plane world is more complete, fulfilled and realistic. Dolomiti 3D Scenery and the excellent Matter﻿horn Park 3﻿D scenery covers the Alps, there are few areas like Monument Valley as well that are covered, but this scenery with Everest Park 3D now covers the "Roof of the World" and the Himalayas. 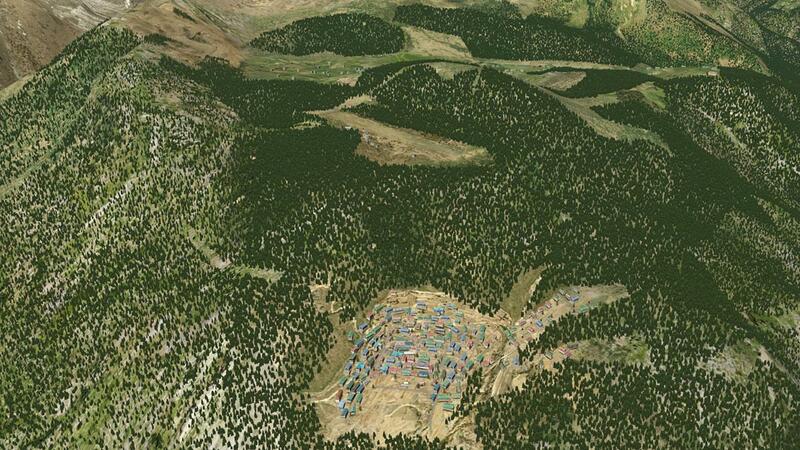 DEM data (digital elevation model) are modeled on 4K (4096x4096) extreme quality images. The results are of course spectacular, but the main thing to remember is that the most important areas are the ones you don't see. Any mesh can be molded to shape, but to get accurate mountain modeling you have to create the actual mountains from scratch, it looks easy... but it isn't and that is what you are investing in here, pure geographical layouts to replicate the real mountainous chains and individual mountains that make up the areas ranges, in other words total realism. 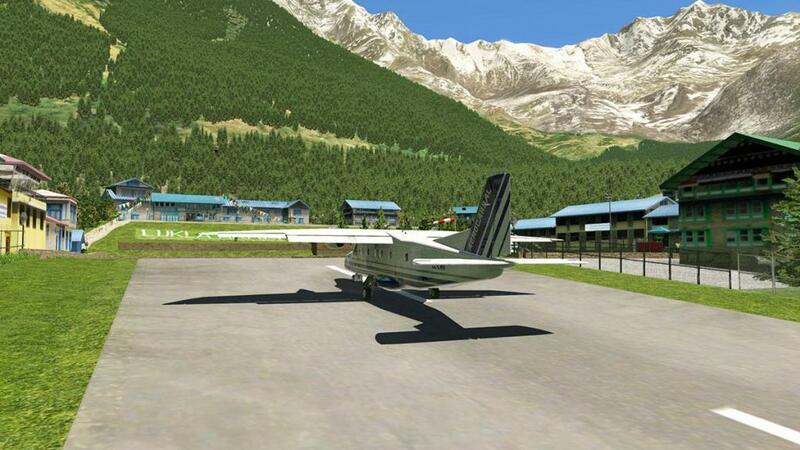 Other highlights include the "Most Dangerous Airport in the WORLD" and that is big announcement, but that is what VNLK - Lukla is, and a huge challenge for any X-Plane flyer of distinction, VNSB - Syangboche, Namche Baza, Tengboche and the famous "Everest Base Camp" are all in here if you want to follow the footsteps of some of the greatest climbers that ever climbed. 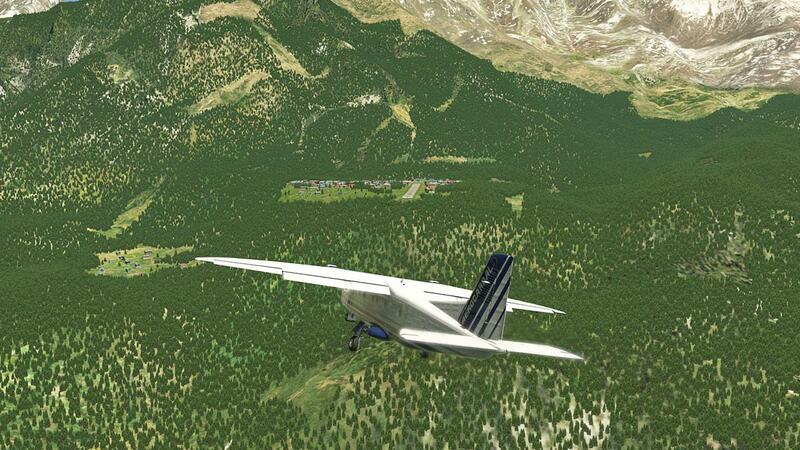 One of my journeys in X-Plane has not just been the flying or the learning of different aircraft and their systems. 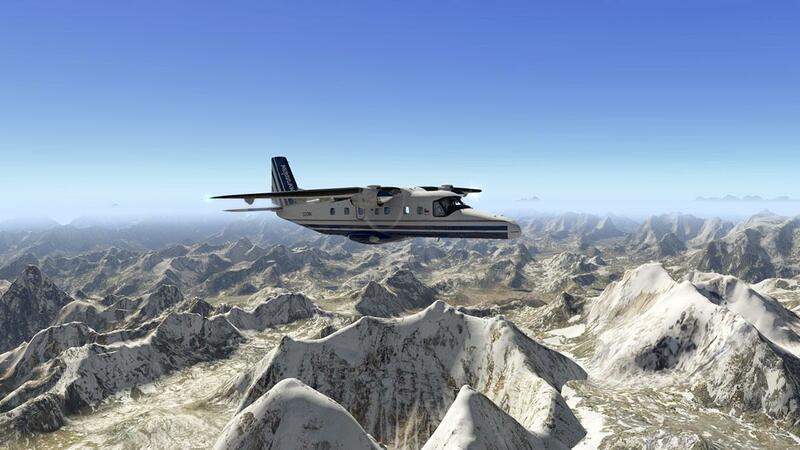 It is also exploring the planet in the many ways that you never expected before... the mountains on the coast of Oman, the sheer beauty and vast expanse of Greenland, the vastness of Australia to the mountains of Afghanistan, sheer beauty all and with high quality mountain ranges like these from Frank Dainese & Fabio Bellini' it again brings the scenery of the simulator up to another higher level of realism and immersion... Highly Recommended. 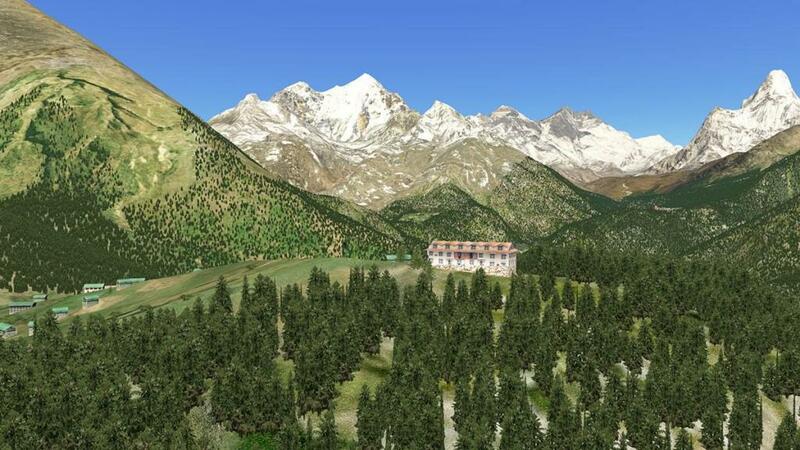 Everest Park 3D includes a territory of about 1000 square kilometers in the Himalayas along with other eight thousand, on the border between China and Nepal. Other famous mountains include the Lhotse (8516), Makalu (8463), Nuptse (7861), Pumori (7161), Ama Dablam (6812), Taboche (6543), Baruntse (7129). 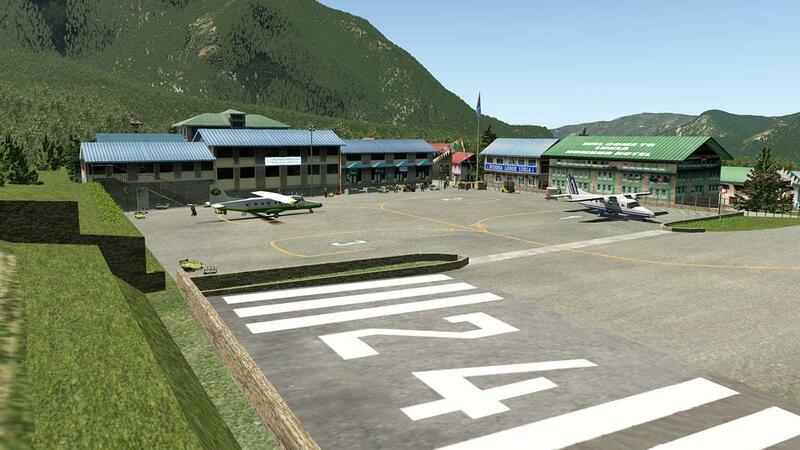 The Lukla airport (icao VNLK) is considered by the pilots, one of the most difficult especially in the landing phase, the track is just over 500 meters long. 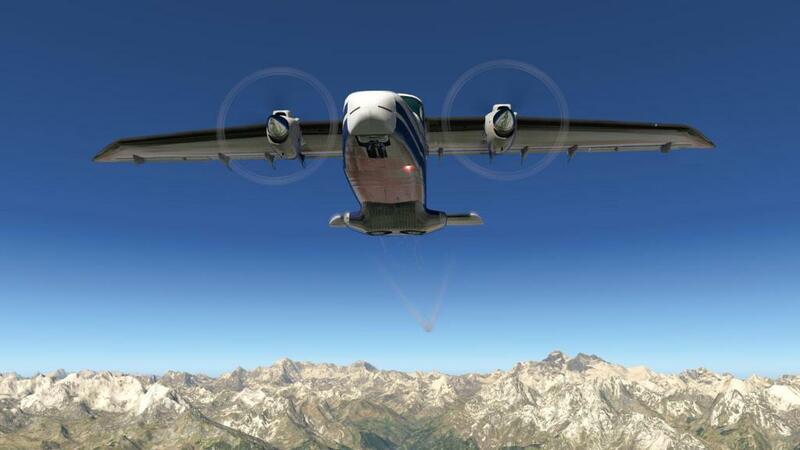 and has a significant change in slope in the initial part during take-off (12%). 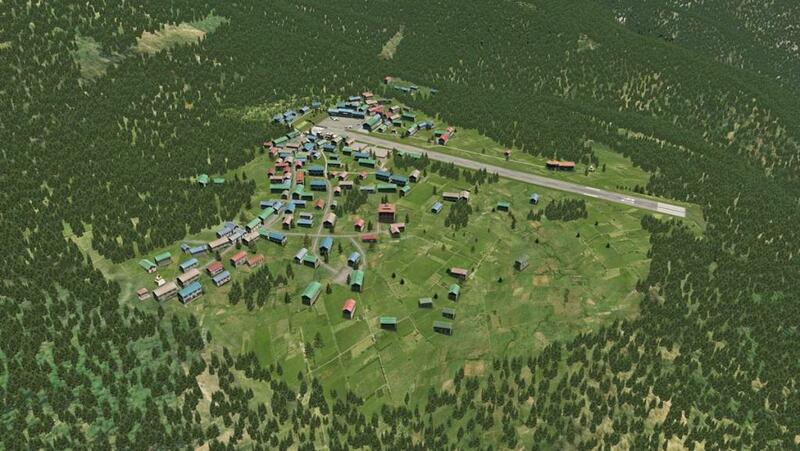 Syangboche (icao VNSB) in clay ground, just over 400 meters long, secondary airport but officially coded. 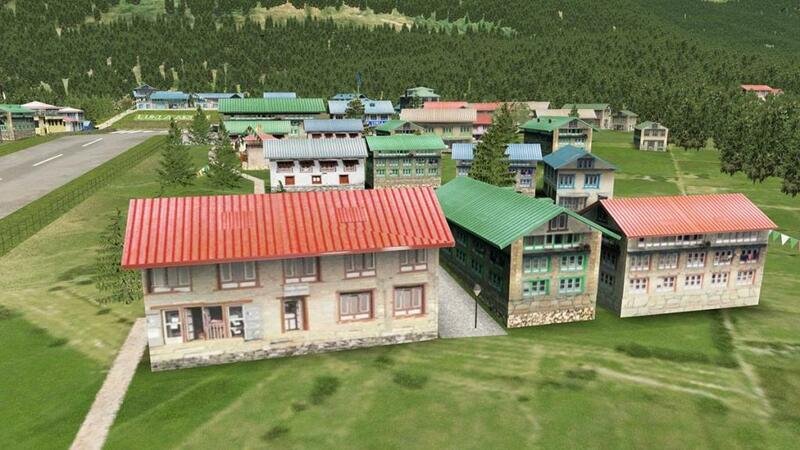 It is located just above the village of Namche Bazar, a mandatory stop for hikers to the Everest base camp. 7 Helipads: inserted in the most important points of the scenery, normally located in residential areas, scattered at various points along the route to the base camp. 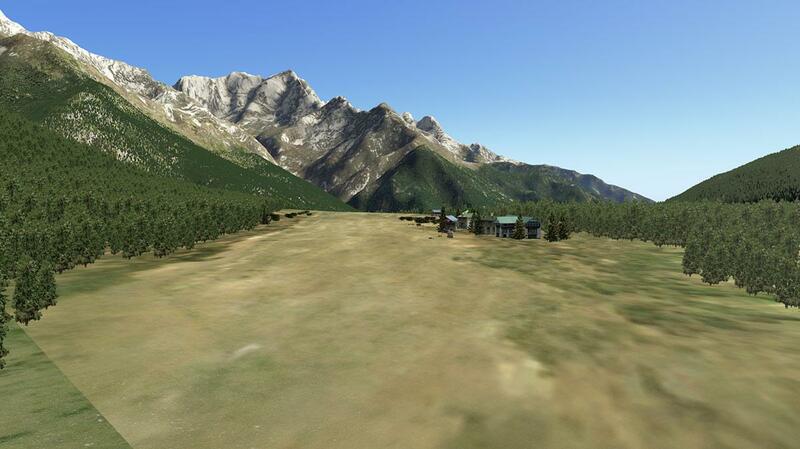 The main mountains of the area have been rebuilt with 3D models. 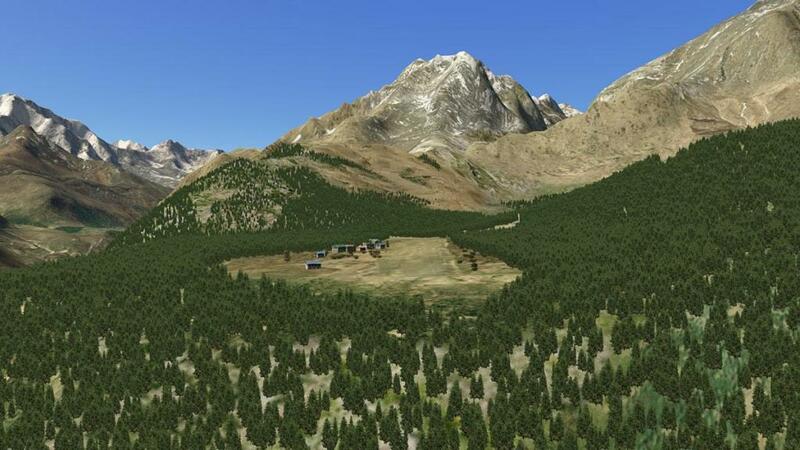 DEM data was used and further corrected with 3D graphics programs. Later the textures were applied, mostly in 4K, taken from high definition photos. 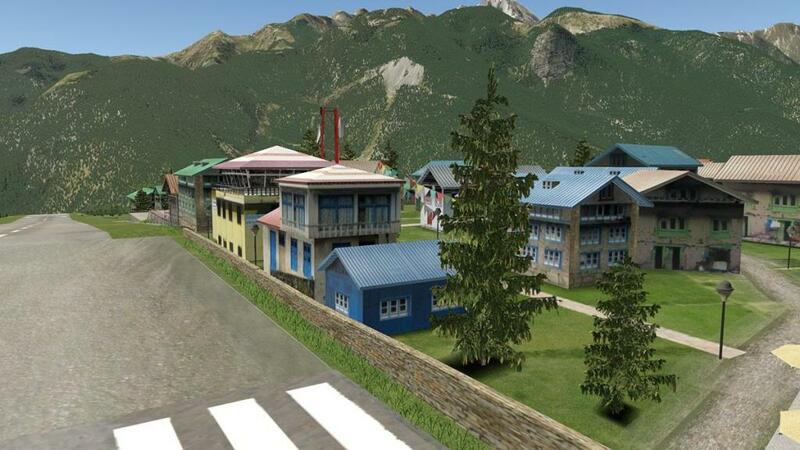 The positioning on the modified mesh was very accurate, respecting the dimensions and the main morphological characteristics of the terrain.\ Summer only scenery Manual included. 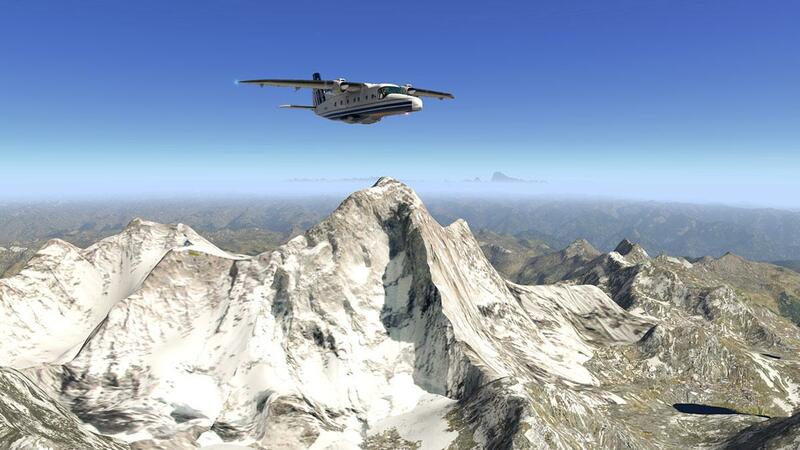 how can the Do228 reach the summit of Mt Everest as you flew it? 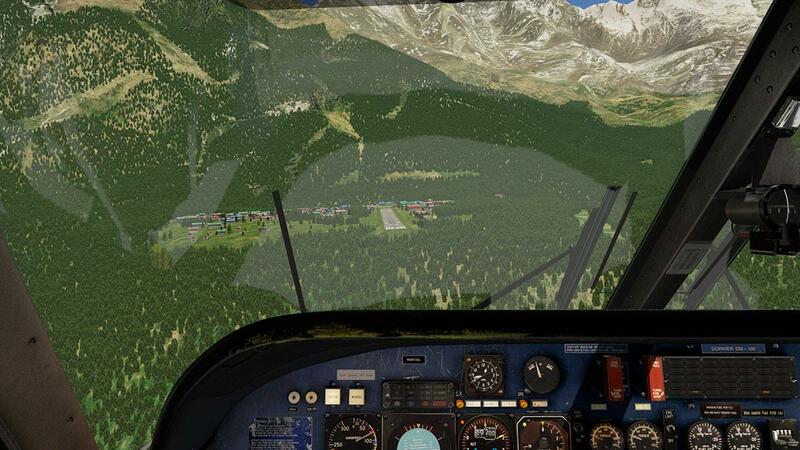 how about fps in relation to plain xp11.3? I enjoy your reviews very much.